to protect the highly positive and beautiful things she is reporting. Our DATA BAR has been moved to clear up space on the Home page and to reflect declining worries about severe pollution. It will be updated less often than during the recent heatwave. DATA BAR is not being updated at present as we are well passed the season for Cyanophycaea bloom! The difficulties and procedures adopted in regular Visual observation of the Lake are described below. While visual, it is important that we apply consistent standards, as pollution of Lough Allen is a very personal issue. One person may say it is fine, when another may say it is a mess! Most of our records come from boat trips. Apart from the weather, it is far easier to survey remote rocky shores and inlets by boat. We would very much welcome help with this work from people living on the shore of the lake, especially during the Winter period. We are dependent on visual observations as the dilution of the lake, and the general economic situation, means that technical analyses on a frequent basis will not be possible. WL27: Bringing the Mussels back home! Weather: Cool, grey, slight southerly breeze. Water rippled. Lake level 2.88 m.
Just a quick trip today to return Mussels to their home at Druminalass before Christmas! A cold afternoon trip with a dedicated helper to have one last check on the shore. As you can see the shoreline is totally different from previous occasions studied in December and November and all the area affected by the Blue-green algal bloom is now inundated along with the Mussel shells, bog-oak and remnants of that bloom. There was no sign of any Cyanobloom now remaining either here or at Annagh Lake or at the inlet from Lough Allen. This, of course is both a good thing, and a silly thing, to have to report on Christmas Eve! Much recent rainfall had caused a substantial rise in water level and this had obliterated and possibly killed the Blue-green algae — but we will check again at low water conditions in the New Year! As reported in previous logs we had found many intact Mussels lying stranded on the shoreline affected by Cyanobloom. These were closed and probably alive and we were concerned that they had been sickened by ingesting toxins from the bloom. Six Mussels had been removed from the exposed shore around the 10th December. This was after the massive predation on exposed Mussels by Otters. The Otters, for some unknown reason, had disappeared, but the Mussels were very vulnerable to predation. Also we wished to see why they lay on the exposed shore as Mussels have a good ability to drag themselves back into water if it is simply the receding water level that caused them to be stranded. From what we have seen in the past two months there seems to be a very good population of Mussels in these shallow bays at the north end of Lough Allen. This is a good sign but being filter feeders they would be very vulnerable both to Cyanoblooms and any toxins or pollutants in the water. At the time of collection we were not convinced that these Mussels were either alive or healthy, though they were firmly clamped shut. They proved to be very much alive and we kept them in cool clean water for the past fortnight at our home. They routinely siphoned water through their system and attempted to move by extruding their muscular feet. We did not feed them as we wanted them to purify themselves of any possible blue-green bloom organisms or toxins they may have picked up at Druminalass. After a fortnight the feet of the Mussels were looking thinner and with improving conditions at the lake we thought it best to return them. The shoreline where the Mussels came from, now inundated by high water. Absolutely no bloom remained but there was a substantial amount of foam which had caused the original bloom about a month earlier. However this was on the surface and the Mussels would be going about 80 cms down so it was thought their best chance was to be returned to their habitat. 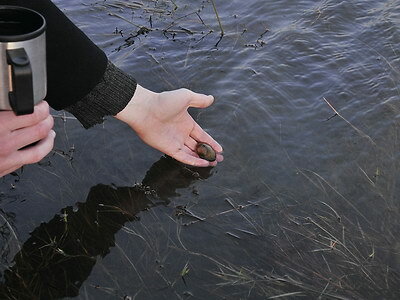 ABOVE: Student returns Mussels to a cleaner Environment. We didn’t actually return Mussels at exact location shown because this was flooded vegetation with little exposed mud. It would have been awkward for the specimens to move through. Instead we found a deep bank underwater and dropped the Mussels over that into deep water where they will probably have found food and shelter. from some artificial source like detergent. This is the last of our WaterLogs for 2013. Many thanks to all those who have expressed concern or given us information about water and wildlife. A new format will be adopted in 2014 and we fervently hope that (like a lot of the Summer of 2013) we can report clean water conditions in many places! We have recently met with Co. Council officials and they agree that Lough Allen is a very central and vital part of the Leitrim environment. Much of 2013 enjoyed improving water conditions. Hopefully in 2014 we can understand and control this recent set-back better! Weather: Mild, grey, southerly wind F4. Lake rough with persistent waves from south breaking on shores, 2.0 m.
Another very disappointing day with widespread contamination on south facing shores and large piles of ‘surf’ building up in places. But, the good news is that the virulent bloom we have been watching over the past fortnight is not now visible in Druminalass in its active green form. This is not to say it is gone. Unfortunately the trigger which led to so many mussels dying is very evident in the form of much foam lying on that shore and the incoming stream from Annagh Lake. We expect a Cyanobloom to recur at some date where this foam has landed! We are, with regret, presenting images of the situation on the shores today. This is very unfortunate at a time when we are engaged in planning a worthwhile conservation project for Spiranthes romanzoffiana, Lough Allen’s valuable orchid. 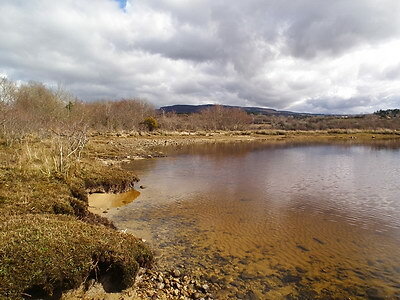 Like many people we felt that the large amount of surfactant material in Lough Allen was being washed through and the input of contamination had declined. Perhaps the good Summer weather in some way reduced the appearance of these problems? Now we are seeing foam everywhere and as soon as you walk in clear water, bubbles appear and stay. We believe it is contamination, i.e. some unnatural product emanating from human activity that produces many persistent bubbles and also probably provides the phosphate for the Cyanoblooms. So depressing! North east corner of inlet at Druminalass. This is the location where much Cyanophyeae Bloom (Cyanobloom) occurred last week. Green crescents formed across the mouth of this little stream descending from Annagh Lake and bloom spread all along the adjoining shore. 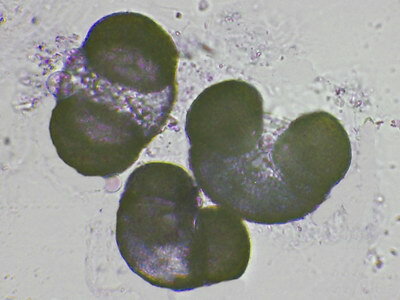 As can be seen there is no visible sign of living green cells of Cyanophyceae. They seem to have grown and bloomed and died off or sunk to the bottom of the lake. In December one would expect such a bloom not to occur. The way things are this year, it is hard to predict! Shore westwards from stream entrance. This picture shows much more foam than we ever saw on this shore when the Bloom was first discovered towards the end of November. However the location of the foam replicates the location of that bloom. To the eye a blue-green stain was visible on the exposed shoreline — although this is not evident in this image. 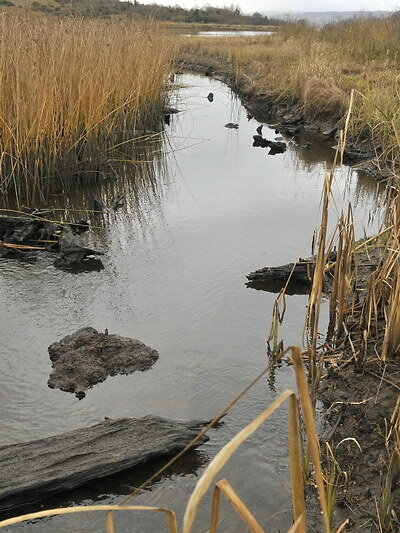 Water level has also dropped considerably during this period with the Bog Oak log being on the waters edge at the start of the bloom on November 25th. 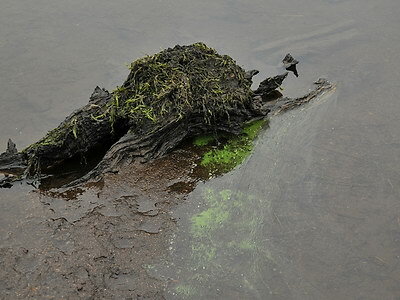 It is possible that the recent bloom was extinguished by suffocation as the Cyanobloom cells were stranded on dry land by receding water levels. Nothing else much has changed. Weather and water are still unseasonably warm and there is obviously copious contamination to ‘fertilise’ any potential bloom. Potentially a cycle of contamination and bloom formation would seem a possibility. 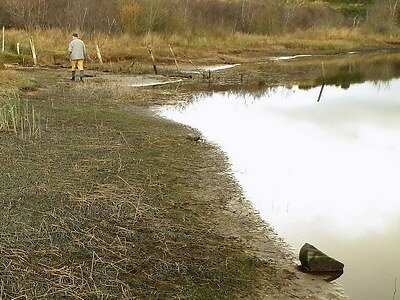 No one really knows as a toxic bloom of ‘blue-green algae’ in December is largely unknown? Lough Allen seems to be a victim of poor waste water management and changing weather patterns. Detail of worst examples of pollution from the above photograph. We have spent an lot of time trying to define this foam. People living around the lake recognise it as something new and artificial. Experts in Dublin have asserted that it may be natural or a derivative of excessive naturally occurring surfactants — but we have never been given a clear idea of what they would be! This foam is distinctive. It’s been a while since we described it so it may useful to reiterate its properties once again! 1. Brilliant white but rapidly absorbs sand and mud. 2. Forms in gentle to strong breeze. 3. Very fine bubbles. Larger bubbles may be natural. 5. Persistent. Will stay for days. 6. Re-forming. It can spontaneously reappear with gentle agitation. 7. Large banks have left Cyan deposits months later! We do not believe any of this is natural and would ask people who tolerate it to elaborate on their views. It is apparently a recent severe and continuing pollution associated with man-made changes! Initially, this survey was planned to confirm that the Cyanobloom present in Druminalass had subsided. Finding so much foam there, the rest of the morning involved checking other likely or vulnerable areas. Likely areas in today’s weather conditions meant any south facing shore; vulnerable areas refers to areas where health worries or loss of pets indicated that a serious Cyanobloom had occurred in the past. Of course the north east corner of Druminalass is protected from a southerly wind and the build up of foam here may have been a local phenomenon with a local source of contamination. It is hard to envisage large amounts of foam coming through the narrow cut into that inlet. As it happened the Lough Allen side of that cut had only slight amounts of foam and no pictures are presented. Similarly, Kilgarriff where foam was present but in no great quantities either. Most of the north shore was visited. Anywhere with exposure due south had some deposition of persistent foam. It was described as unsightly, which is probably a good way of looking at it. However, potentially, also harmful and clearly destroying the amenity value of a wonderful place! a) East Shore of the Shannon (on north shore L. Allen). 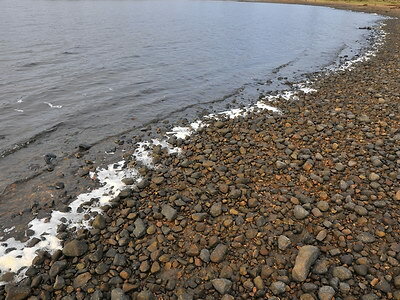 The large photo on the Right shows widespread deposits of foam along this shore in a pattern observed before when we first started to study this foam, and its appearance, in large amounts around north Lough Allen. Because of its scale of deposition, and as the weather was not a full gale. this amount of contamination might be defined as serious pollution! 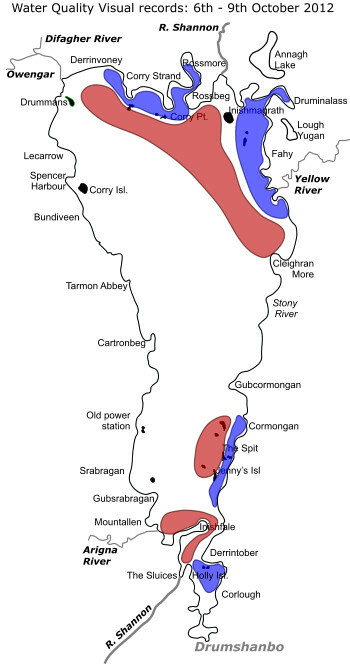 We define Corry Bay as the large bay east of Corry Strand and immediately west of Corry Point. Corry Strand (below Right) was not that badly affected, possibly benefiting from being a bit further west with maybe a reduced reach for a southerly wind. Corry Bay was badly affected. This is very disappointing as it is an area where people have suffered from pollution before. It is very exposed to the south with small headlands either side offering no shelter from a strong southerly wind. 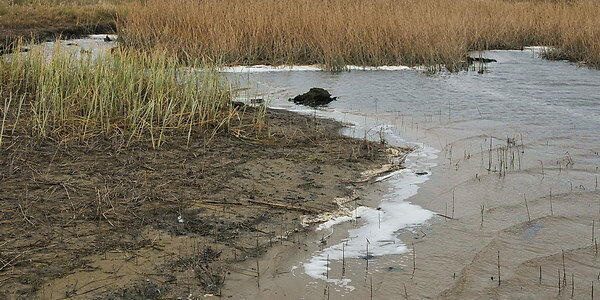 Large banks of foam were built up here with the example (Below) being one of the worst we have seen in two years. ABOVE: A good example of how this foam persists. The top material has recently landed and is caught around the Bog Oak. Older materail that has rolled in the mud/sand is in the foreground and has been on the shore for a longer period. This may not disappear until either rising water level floats it off or a very strong wind whips it off. Corry Bay with piled up layers of foam. 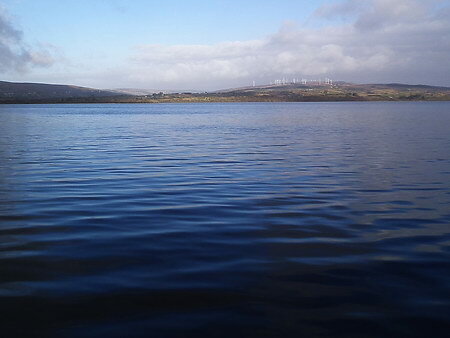 Sadly, following a year of variable weather and improving water, Lough Allen’s condition now appears no better, and maybe worse, than in 2012 — the year of serious contamination and toxic Cyanoblooms. This is soul destroying both for people like us who have worked hard in the area but even more so for those who are directly affected by this Pollution. Not so much at Corry Strand... and river was clean! We have tried in many ways to report these changes and relate them to relevant authorities. Regretfully, it must be said that much has fallen on deaf ears. We appreciate local people’s concern but the Lake is otherwise widely ignored! We would do anything to see this environment clean again and work with any agencies or individuals to achieve this. Sadly, we had innocently hoped things were improving! Weather: Cool, grey, calm with occasional mist. Later slight westerly breeze and ripples Water flat calm, 2.0 m.
The unexpected Cyanobloom at Druminalass has been very worrying and the damage to biodiversity significant. The Otters have had a great meal, hopefully at no cost to their health. On a visit to the site today (one of many in the last 10 days) the situation seemed to be stabilising with only a small quantity of active green bloom. We would be hopeful that it might further decline but there is evidence of potential bloom causing contamination all along the shore. This, and remaining warm weather pose a threat to wildlife and environment. Bloom: Thankfully this is the only sample of active Cyanobloom found along the north shore of Druminalass today. This bloom seems to have taken a course. Originating at the mouth of the stream entering the site from Annagh Lake, being virulent from there to about the middle point of that north shore on 25th. November. Then associated with falling water levels spreading westwards until all the shore at some time was affected by the bloom — as evidenced by cyan stains on shore and vegetation. BELOW: Whilst an active bloom has declined the probably cause is more visible than ever. Photos reproduced below show the clear link between this artificial foam and the start of a Cyanobloom. The source of this foam needs to be found and controlled. 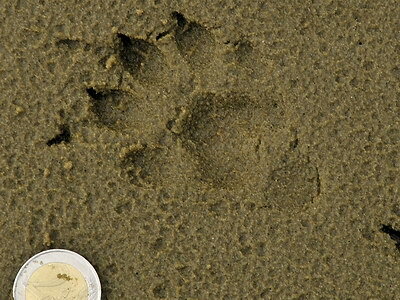 RIGHT: An Otter footprint of about 100 mm. in the sand at Druminalass where they have eaten sickened Mussels. Ratio between eaten and uneaten Mussel shells. An anomaly in predation exists; more stranded Mussels are being left unharmed in mid shore! At the start of the Bloom Otters were very active at the eastern end of the north shore collecting Mussels and bringing them back to an eating place. 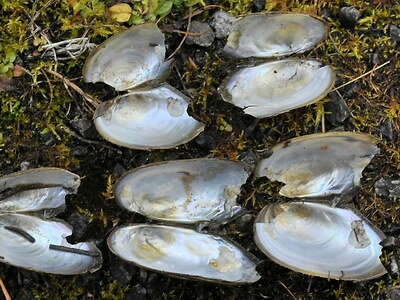 Nearly all Mussel shells seen above water had been eaten. The western part of the shore near the exit to Lough Allen only became severely affected by bloom (to our knowledge) by about the 30th. November. Mussels seemed to suffer the same fate there (stranded above water and lacking in ability to migrate) but they were NOT being eaten so much! Assuming all closed shells were alive then a clear majority of available Mussels were not taken! Unfortunately, we do not have this data for the 25th. November but our recollection is that the vast majority of shells seen had been predated. (Check photographs in Logs below.) The implication is that the Mussels are not attractive though very available, that the Otters have moved on, or that the Otters could have been sickened/died from eating Mussels at the early stages of the bloom. We cannot determine what the truth of this situation is. 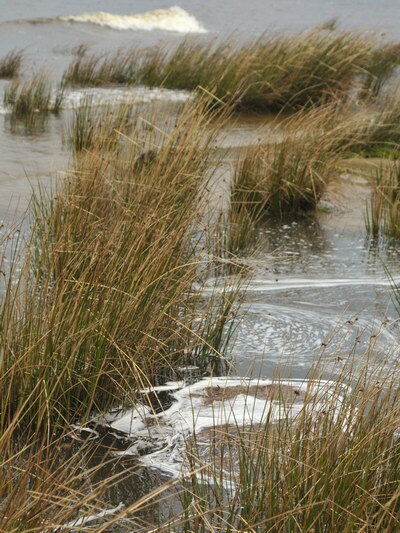 But the possibility of contamination in a very seclude part of a large water system could lead to an unseasonable bloom which then kills Swan Mussels and may affect the food chain and wildlife even more than that, is a serious issue and one which needs to be addressed if we care about our environment. Presence of contamination will undoubtedly impair people’s future enjoyment of the amenity. 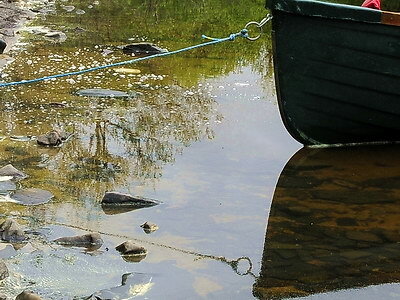 There are only so many waterways entering Lough Allen — they need to be monitored. Possibly this Bloom may now end. Cold weather will help that. However, continuing dumping of detergents or artificial surfactants seems to be ongoing and a respite seen during the Summer may have only been a response to warm weather. The visibility of foam seems highest in cooler weather with calm or gently agitated water. Testing for foam is difficult. 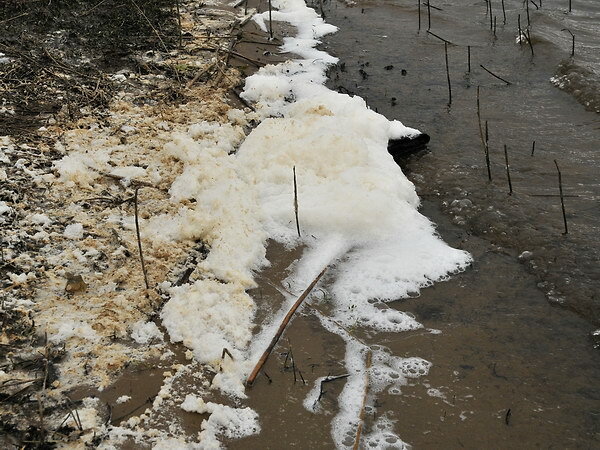 Phosphate levels can be measured on the assumption that the foam is an indicator of detergent or water treatment type products (containing phosphate) in water entering the lake. But the link between phosphate levels and foam levels has not been proven — though strongly indicated. WL25B: Update: Mussels dying because of Pollution! Weather: Cool, grey, calm with occasional heavy mist. Later slight westerly breeze and ripples Water flat calm, 2.06 m.
Druminalass Inlet, NE Lough Allen, winter sun, low water, bloom on left and facing shores! Part I: Of Mussels and Pollution. 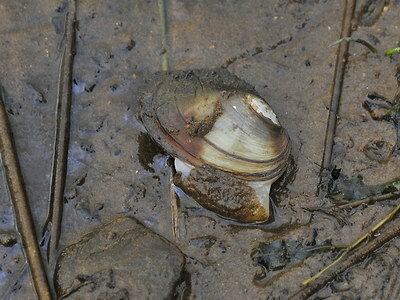 Swan Mussels are indicators of pollution. They are now dying in excessive numbers in Druminalass. Another good weather day prompted a further research trip to Druminalass, Annagh Lake, and the Yellow River mainly investigating Jack Snipe, Goldeneye and Mussels but keeping an eye on the rapidly changing water situation. Firstly, it is dropping more — now extremely low for end of November. Secondly, whilst in many areas Lough Allen looks clean there is a return to the worrying pattern of persistent foam lining certain shores, scum on the open water, and Cyanoblooms (= blooms caused by toxic bacteria-like micro-organisms). What is causing Blooms in November/December? These are not meant to occur in Winter as the prerequisites for Cyanophyceae to bloom are calm water, sunshine and warmth. What we have had is a bit of warmth, low rain recently and a dropping lake level exposing mudflats. In the absence of a clear theory we present much data and observations here. Already some patterns are starting to appear. With a bit more evidence it may be possible to determine a cause and work out preventive measures. Of course, we tend to attribute these problems to an upsurge in visible contamination in the Lake over the past 5 years? We summarise knowledge to date in the Table below. This is intended to sharpen our focus and to share ideas and observations to date. But, it clarifies issues if we can outline some specific information — and then supplement that with images at the bottom of this Log. 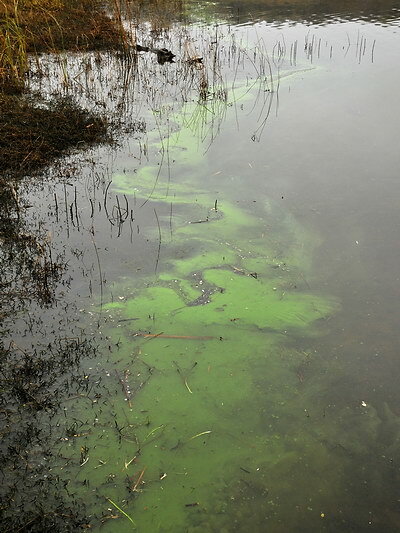 Late November 2013 Cyanobloom in NE Lough Allen: Review and Discussion. A Bloom, not seen in the Summer is present in discrete locations? Unusual Natural factors at play? Warm with little night frost and mild dry days. Water 8°C., calm but rarely still. Other factors exposing microbes or promoting growth. Evidence of surfactants maybe linked with phosphate. On-going eutrophication of Lough Allen. Point source release of nutrients promoting bloom? Mussels dying specifically in area with Bloom. Unlikely. We have searched clean Mussel areas and seen no other high levels of loss. Low water is exposing them? Mussels can (and do) move into deeper water. Mussels absorbing dangerous levels of Cyanophyceae? Mussels in polluted areas seem less able to escape and are becoming poisoned or stranded. Filter feeders bound to concentrate local contaminants. They seem more vulnerable to predation by Otters etc. Strong visual correlation between dead Mussels and Bloom location. 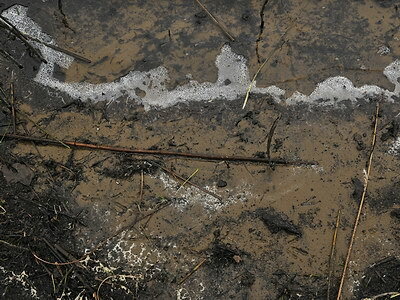 Much oily material is leaking from drying out beaches and mudbanks. Often seen but not specifically associated with either foam or blooming. Normal but at a higher level? At higher level after a fertile Summer? Nearby rich habitat but no sign of anaerobic discharge. No known link to Bloom? Flow of oil on water is similar to Blooms on water. This is one time we cannot give any rational opinion. Presence of a Cyanophyceae Bloom in Lough Allen at this time of year is very disturbing. It generates large numbers of new cells which have the ability to sink to the bottom of a water body and re-surface next Spring or Summer. However, cold weather is promised and the area in question is shallow — a prolonged spell of cold weather might well bring this present outbreak to an end. Let’s hope so? We present more images than usual below in the hope that some evidence there may trigger a response from people expert in this area. We would hope that some steps can be taken to reduce any pollution attributable to artificial contamination and that the, largely bloom free, Summer of 2013 can be repeated again next year. This is a view of a small stream flowing into the site in question. In this area there are a series of enclosed waterways. A large fishing lake to the north, which we know as Annagh Lake, leads through this channel into Druminalass. There is normally a steady flow in this stream so water moves from Annagh Lake into Druminalass. i.e. any contamination found in Annagh Lake is likely to originate there and may quickly move into Druminalass and Lough Allen. It will be noted that the water flowing south appears relatively clean. However, as can be seen, it meets bands of Blue-green algae as it enters Druminalass. This graceful arc is a pattern we have seen in other locations where a stream enters a polluted lake. Not sure of the cause but the deep channel is at the far side of this picture. The flow enters the lake at an angle and this may cause a circular movement in the water sucking bloom in from the shallow water at the bottom of the picture to join the deeper flowing water at the top of the picture. Whatever the cause there was a movement of water (as shown by the bloom) along the north shore of Druminalass to meet the in-flowing water from Annagh. North shore of Druminalass. Bloom is now known to have occurred all along this shore during the past week. Further remnants and deposits have been found today. Previous days surveys ended at the right of this picture but more dead, killed, or stranded, Mussels were also found along this stretch. This is near the exit channel to Lough Allen and traces of the cyan colouir can be seen on the stone, the leaves of the Shorweed plants in the foreground and (not in the photograph) the sandy beach on the Lough Allen side of the exit channel. Was the Bloom spreading from shallow calm water of the inlet out into the open lake? Middle of north shore. 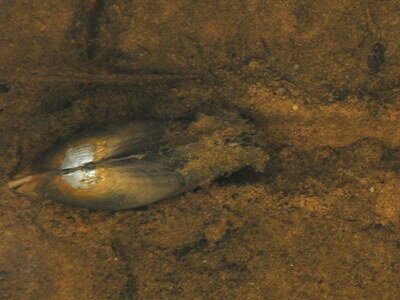 This Swan Mussel (Anodonta cygnea) has been stranded and is making painful efforts to move back to open water. “This species primarily inhabits closed off and small waters such as ponds and peatlands, but can also be found occupying lakes and slow-flowing lowland rivers... The species appears to prefer waterbodies characterised by high concentrations of dissolved oxygen... free from floating vegetation and with fertile bottom sediments... 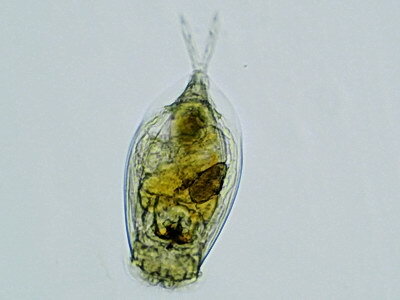 The species is intolerant of poor environmental conditions, and can be used as a bioindicator of clean water.” (Extracted from RedList.org). An interesting study of declining environmental quality affecting Mussels in Poland is HERE. Another younger specimen showing good vitality, ploughs its way into deeper water. Mussels were very evident in the shallow water here whereas they were almost invisible in another ‘mussel bed’ in a clean bay of Lough Allen a bit further south! 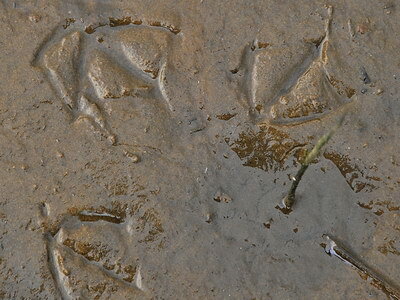 Duck footprints, probably Teal. 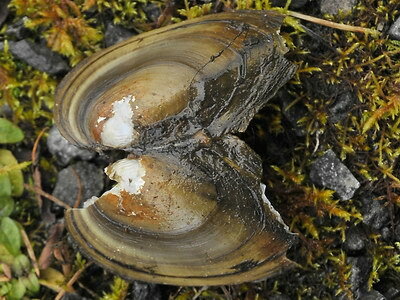 Some ducks will eat Swan Mussels as they have a softish shell especially when young. Swan Mussels can grow up to 20cm. All specimens found were less than 8cms., mostly a lot smaller. Of the ducks the only species likely to take Mussels would be Goldeneye. Goldeneye have been found in another Mussel area at Yellow River in recent days but we have not seen them in Druminalass yet. They are an infrequent species in Lough Allen and probably attracted by cold weather and shallow water. They are particularly drawn to the Yellow River bay but we have seen no predated Mussels there. This is a large shallow area populated by Water Beetles which might attract them also? Close up of a Swan Mussel ‘escaping’. Can be seen to be actively respiring via its ‘siphon’ just visible at the rear of the shell. Swan Mussels are Bivalve Molluscs that filter large volumes of water and are therefore in a position to concentrate any toxins occurring in the water and pass a more toxic load on to any higher predators. 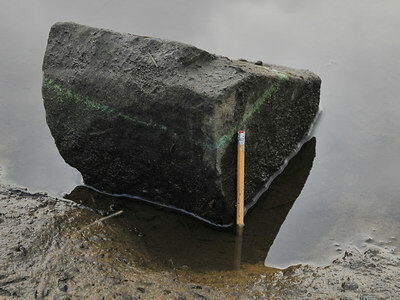 LEFT: This rock is at the western end of the north shore of Druminalass close to the exit channel leading to Lough Allen proper. We use this image to show that the Bloom has been present along the full shore of this inlet though not visible in all parts at all times. Also the bloom line is largely green indicting that that deposit may only be 2 - 3 days old. The pencil used to measure the change of water level recorded a drop of 10cms. in a few days! The length of this shore infected is now 200m. and small amounts of Cyanobloom have also been detected on the eastern shore at the north end of the inlet. A ‘midden’ found on south side of the cutting linking Druminalass to Lough Allen. There is a shallow sandy beach opposite this and possible mussel habitat in the channel? Cyanobloom was also starting on the beach today. PART II: Visible Contamination elsewhere. In researching the problems described above it was apparent that there were some increasing contamination issues in Lough Allen. This comes after a long hot Summer when water temperatures reached 24°C. and there was no Cyanobloom worth noting on the Lake, just fairly routine levels of harmless green algae ( the stringy stuff) in late Summer. Also, visible contamination was markedly less during the summer. Persistent foam such as this requires a gas (air) and a surfactant to persist. It is possible that the warm Summer weather caused the ‘gas’ to expand and burst the bubbles almost instantly! It is sad that this problem is back and obviously so; we had hoped it was a diminishing problem but it seems simply to be a problem of cooler weather. 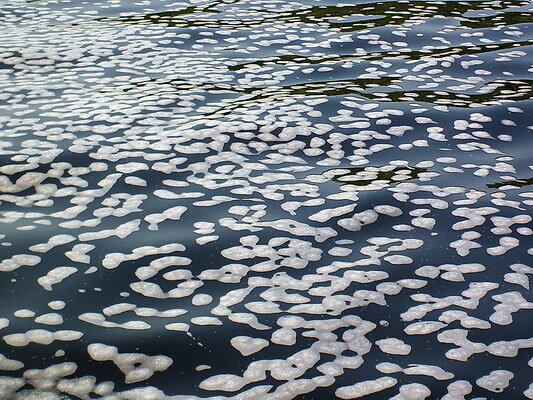 These shiny white fringes have been a feature of Lough Allen shores since 2008 when we first noticed them They have been matched by large persistent bubbles being left by boating or other activity in the lake — again indicating an overdose of surfactants! We reproduce 3 images to briefly represent the problem, but we’d really much prefer if it would just go away and leave us in peace! 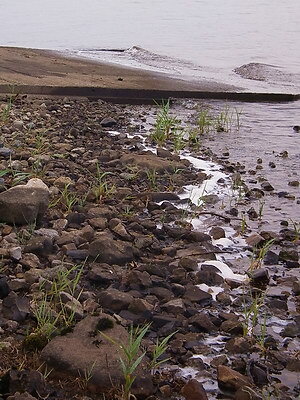 An exposed gravel bank at the mouth of the Yellow River. This rather attractive scene hides the nature of this unnatural foam. It is unnaturally bright and unnaturally persistent! This was a calm day yet the slight waves present have built up a line of foam on the westerly side of the spit (left of picture) and none in the sheltered easterly side. This buils up so easily and lasts so long. It may contain nutrients such as phosphate that can trigger a Cyanobloom? LEFT picture: Near Fahy Graveyard. A short distance further north on a north west facing shore of the bay at Fahy graveyard — a long persistent fringe of foam until the curve of the bay brought the shore to face a differing direction, not suitable for agitation and deposition of foam! 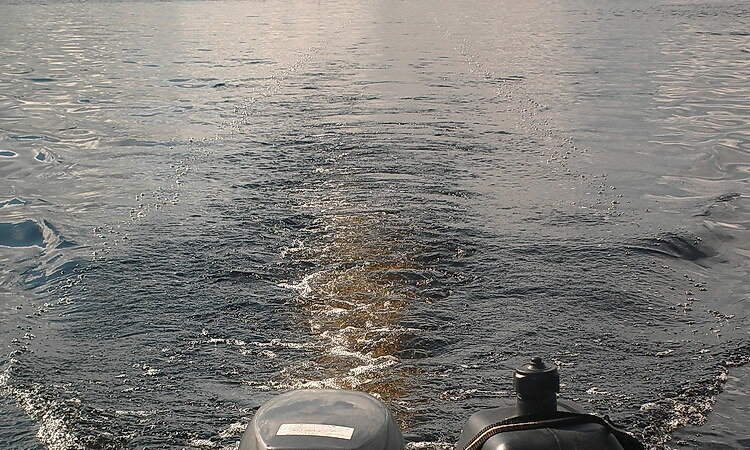 It would be highly desirable if such surfactants were not allowed become widespread throughout Lough Allen. They could ruin things for everyone! RIGHT picture: Foam and Bloom linked. This is in Annagh Lake (the lake that feeds into Druminalass) where a stream enters its northern tip. The image shows the way crescents of green and white are mirroring one another. This can hardly be coincidence; surely the Cyanophyceae in the calm water must be ‘feeding off’ the nutrients in the foam? WL25A: Update: Bloom has cleared? Weather: Cool, grey, calm with occasional heavy mist. Water flat calm. A return trip was made by foot this afternoon with the intention of collecting more specimens especially where the foam occurred in the second photograph on the left (below). Lo and behold, the bloom haws completely vanished, at least in the form of a green soup. Initially the shore today looked clean, but littered with Mussel shells. 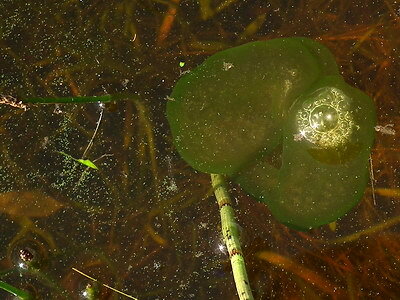 On closer examination it could be discerned that this bloom had covered an area of 100m along the shore and 5m from the top of the shore to the edge of the band of Horsetails and in the water. Water level has again dropped sharply since the previous report and most of the shore occupied by the bloom then is now dry — as if the bloom has been absorbed into the ground? 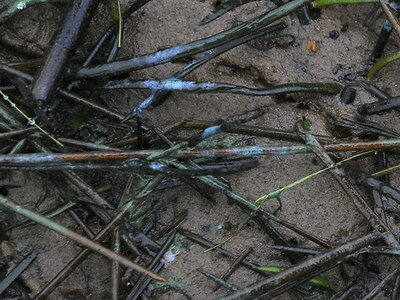 On that dry shore and on the stems of vegetation in the water, traces of the Cyanobloom can be discerned — now starting to go that dreaded cyan colour typical of a Cyanophyceae bloom. Small traces of green cells can be seen on the shore but, by and large, the remnants are now turning blue! What on earth caused this bloom to come and go so quick and why have we not seen it anywhere else in Lough Allen. It still seems that caution needs to be taken when entering the water of Lough Allen. Old rotting Horsetail stems pepper the shore at this location. Today there is no visible bloom left on the water though we have no photograph to show this. However, the waters edge shown as green on Monday (Below) is now clear and appears as shown on image with shells on Right. Closer examination of the shore vegetation gives a picture of a bloom being drained away and drying out on a receding water level. The living green bloom has now changed to a dried up cyan bloom. All these stems in the area have three bands of colour. Grey at the top, cyan below that, and green at the bottom where the liquid bloom has only recently left. The ‘panorama’ below displays many stems all with this consistent pattern. Using these markers we were able to estimate the 100m X 5m. extent of this bloom. 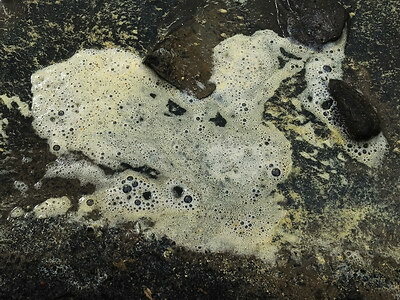 The probability that it was producing toxins (but not any longer) is suggested by the foam in samples of green bloom shown below, the presence of Microcystis, and the numbers of eaten or disabled Mussels along the same shore. when an Environment goes bad. Mussels die/weakened and eaten by Carnivores? an Otter. We know they are in the area. What effect will this diet have on the Otters? * ‘Cyanobloom’ ... not a recognised term. vegetation as the bloom is ‘beached’ and dries up. for water quality next year? including Fish, Birds and Mammals? These are like engineering guidelines used to level a new road. They show when a Cyanobloom was present and the extent of it — two very useful bits of information! On Monday no cyan tips were noticed and the water was up in what are now the grey or cyan zone. The dry beach of today had 10 - 15 cms. of water on it with a dense green live Cyanobloom. It is amazing to see that bloom now gone. It appears as if it sank into the soil and all the colonies and cells were destroyed or went into hibernation. We hope so! Not a single sign of a green soup in the water was visible today — just cyan deposits left on the Horsetails and drying out on the shore. 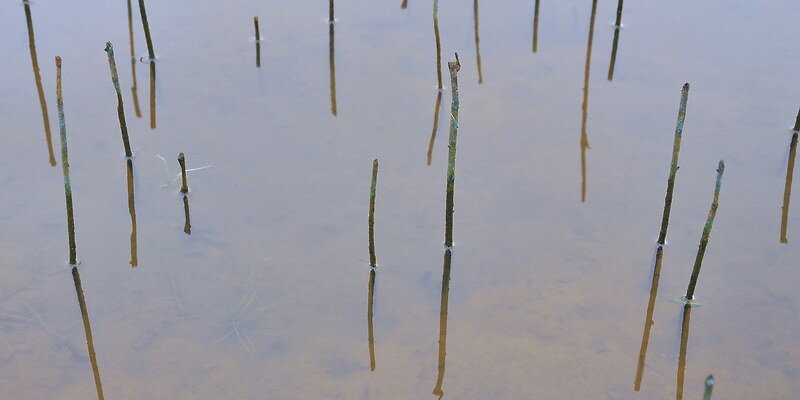 These deposits were found right up to the ‘high tide’ mark and up to 5 metres from there into the lake where they occurred on the stems of the Horsetails. This band of bloom ran for about 100m. along the waters edge occupying approximately half of the north shore of Druminlass Lake. It was obviously a vibrant and (probably) toxic bloom. Why did it end? In cool water Cyanophyceae have the ability to sink into deep water and reappear when conditions suit them. They can come to the surface by injecting gas into their cells — like Nostoc pruniformes. We attribute changes in Lough Allen waters to increased levels of effluent being allowed enter the Lake. 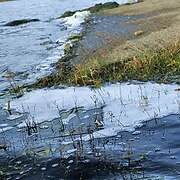 In the past five years or more, a tracer foam of an artificail nature (e.g detergent) has become evident around the lake. This dissipated for a while and hot conditions do seem to mitigate this ‘tracer foam’. Hot gases causing bubbles to burst quicker perhaps? However, with cooler weather there is visible necklaces of foam on shores facing into a gentle wind, and there is scum flowing down the current lines in the lake. We had felt that the water of Lough Allen was much improved this Summer and this is the first significant Cyanobloom that has occurred — and in November? That is ridiculous! or other end of the shell. toxins that are in the water. from an unexpected feast of Mussels coming up out of the mud or becoming stranded on a shore with receding water. There were large numbers of mussel shells along the shore where the bloom had lain. It is clear in these events that there is a direct and dramatic food chain involved — from primitive (though wily) ‘bacteria’ to a filter feeding Mollusc, to a predatory Mammal or Bird. At all these stages the neurotoxins can be concentrated or they may also become inactive. It seems that mussels have been weakened or disorientated by the bloom and have been caught or stranded on the shore. Apart from the dead specimens seen, four other mussels were also collected far above the water but in an uninjured and living state. Maybe hauled up there by the Otter but not yet eaten, or stranded by receding water and impeded ability to move? These are presently alive in a tank of clean water to observe their continued survival! Close up showing the large bight used to open these shells. The shells are quite soft and probably easily opened by a strong animal. They don’t need to prise them open! Also known as Duck Mussels and with a scientific name meaning Swan mussels, maybe they are a food for certain species of Ducks? Doubtlessly, this report will bring up more questions to be answered. But don’t eat Mussels or enter the water if it is pea soup green. County Council have been informed. WL25: A SETBACK: Late November Cyanophyceae Bloom! Weather: Cool, grey calm or slight SW breeze, occasional heavy mist. Water 8.7°C small waves. One of the Cyanophyceae (Aphanisomenon sp.) found today. An opportunity was taken to survey the northern end of the lake today, mainly for Waterfowl. Unfortunately, following a period of growing optimism that Lough Allen’s water was getting clearer today’s trip, from a water quality point of view, proved disappointing. 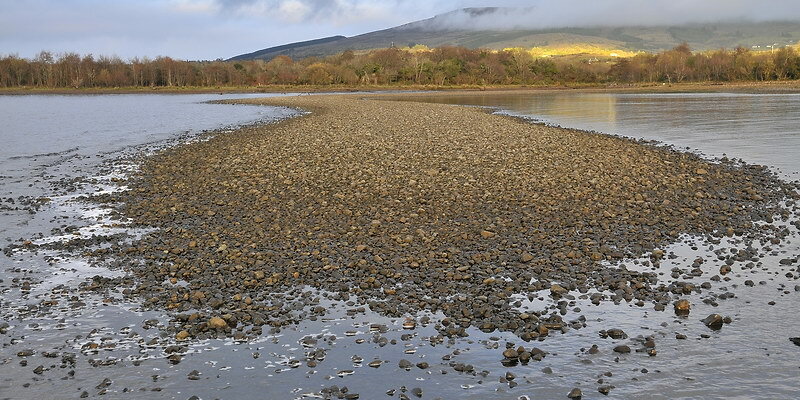 Initially at launch at Corry Strand the local stream and shore appeared clear. Unfortunately the business of launching our boat generated some long-stay bubbles in the otherwise clear water and these were further apparent as we started moving. 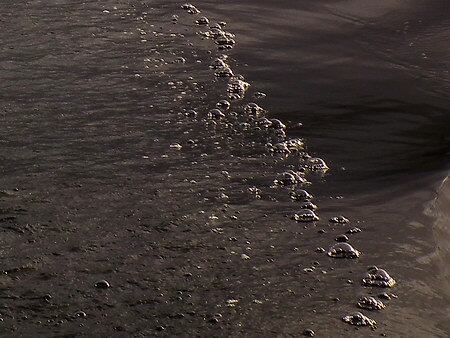 Persistent bubbles were produced indicating some heightened surfactant level in the water, some foam was visible on a south facing shore near Drummans Island. Finally, unexpectedly a significant area of very virulent Blue-green Algal pollution was encountered on the north shore of Druminalass lake. As indicated above it seemed safe to assume these would have been gone for the Summer? This disappointing discovery (unprecedented in November) has been a bit of a set back and is the subject of this report. This Bloom was found just along the edge of the water on the north shore of Druminalass, a small lake in the north east corner north of Fahy and east of Inishmagrath. 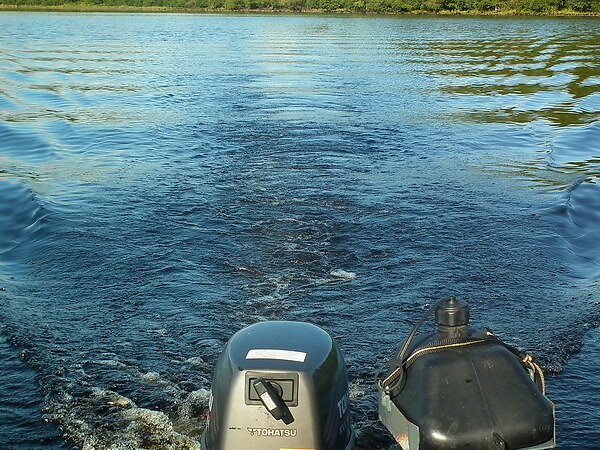 This is cut off from Lough Allen except for a dredged channel. It is a quiet area with shallow warm water in Summertime. This is the first significant Cyanobloom we have seen in 2013 and it was quite a shock to come across at a time when we were wondering was a cold thick mist going to make our return trip difficult, i.e. in Wintry conditions! Also, quick examination revealed a much more concentrated bloom with several species present and actively growing. 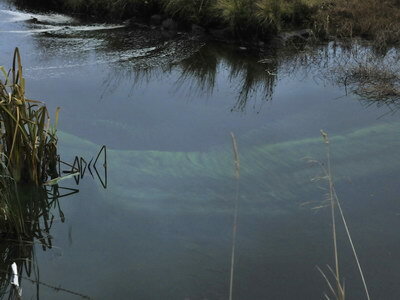 The visual appearance was different from the largely Anabaena type blooms we have seen as marginal occurrences since the large scale bloom at the north end of Lough Allen in 2012. Dense fingernail clumps could be seen along the edges of the dense soupy areas. This is due to the presence of Microcystis sp. shown on the right. This photograph, and the following ones, show the dense nature of this bloom. There are millions of colonies present. The colour really stands out as this was a dull overcast Winter’s afternoon with dark water and brown vegetation. The scum shown here could be toxic as Microcystis almost always produces toxins! This is a new (and very unwelcome) species to us. We have seen a similar bloom in other local lakes over the years but only once seen a dense bright bloom such as this in Lough Allen. That was in an enclosed pool on a dried up beach in hot weather many years ago — not in November. This is probably a Microcystis sp. and the colony structure is much different from the Anabaena samples we have shown earlier in the year and during last year. Here, you can see a large colony suddenly bursting and cells dispersing into the surrounding water. Bursting, in this case, may have been due to the microscope slide. Strangely enough this bloom was not visible from the open lake probably due to the calm silvery reflection on the water. The shelter of our boat is used here to clearly record the sheer density of this bloom and the associated round blobs coming off from the margins of the colony. 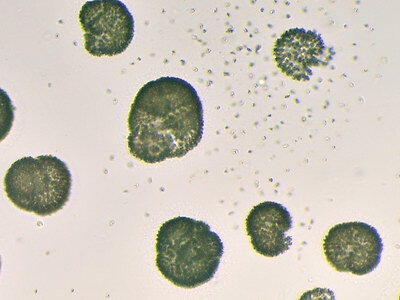 These readily visible blobs are indicative of Microcystis and probably represent greatly enlarged single colonies like the ones shown above and on the right. 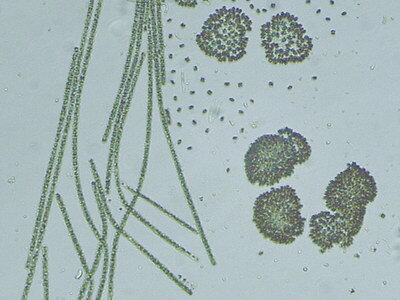 This photograph shows a third species of Cyanophyceae found in samples taken from this bloom. Formerly called Oscillatoria, now Planktothrix. Please NOTE all these species are capable of producing Toxins. Whether they were (at the end of November) is not known. 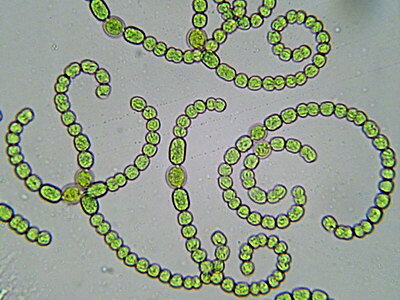 Examination of several samples taken from this bloom showed the presence of colonies of Anabaena sp. Not in dominant numbers as seen previously. Unfortunately, this is not a great photograph but another interesting fact observed is that there is an apparent low number of modified cells, Heterocysts, occurring in these colonies. Samples from earlier in 2013 always had prominent numbers of Heterocysts, and Heterocysts are thought to be responsible for fixing Nitrogen — indicating that there may have been low nitrogen levels in the lake earlier in the year and this protected the area from the worst of a Cyanobloom that we had anticipated? We will try to get better photos and more evidence to sustain this theory. But dissolved Phosphates is normally regarded as the trigger that starts a Cyanobloom?. After a very hot Summer with minimal localised and patchy blooms, mainly of Anabaena, It is shocking to come across a situation like this. In many ways the present mild weather is a blessing but a good hard Winter is badly needed to condition the ground and eliminate any blooms such as this. Even then it would be worrying to consider such a prodigious stock of Cyanophyceae ready to start a bloom next year should ideal conditions once again arise. We pose some simple questions on the right. Love to have ideas and suggestions from anyone who knows these problems better. Is the stillness of the location a factor, could animal waste stimulate this (We know it helps start Green algae growth)? Could the relatively high temperature of this cut-off lake be a factor. Who knows? If you do, please tell us. It would be nice to have another year (next year) free of pollution! Will hard frost clear the water? Can a localised bloom ‘seed’ the whole lake? 2013 was a year in which we feared pollution but suffered little. It was hot, calm and sunny at a time when a Cyanobloom could be expected but the water though warm showed no serious bloom with only Green Algae (which we regard as benign) becoming evident in the Autumn where it was to be expected. It is very sad to now be getting a fairly robust colony of the potentially toxic Cyanobloom towards the end of November when this should normally be over! REDUCING THE INFLOW OF ALL POLLUTANTS AND CONTAMINANTS INTO LOUGH ALLEN WOULD GREATLY HELP THESE RECURRING PROBLEMS! 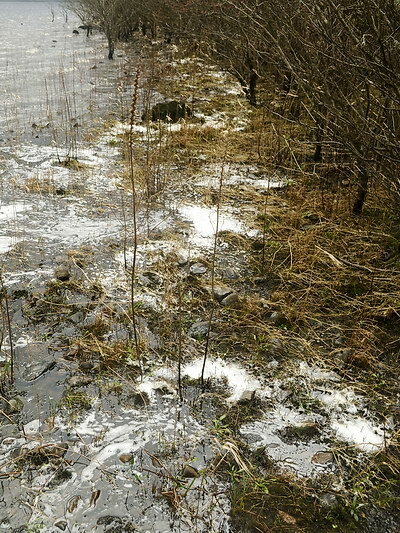 Foam can come from natural sources but most of this has different characteristics to the sort of white fine foam that has been appearing around Lough Allen in the past several years. Synthetic based foam typically has this appearance. In the absence of any other clear cause we have postulated that the widespread dispersed source could be Treatment Plants or the installation of newly specified Septic Tanks in one-off dwellings around the Lake! The reasons for this hypothesis are... the persistent nature of the foam, very fine texture and ability to re-appear time and time again, the similarity to foam coming from known Septic Tank sources, and the history of the two events. However, in more recent years, we have seen such foam in surprising areas like upland forests, blanket bogs, and fresh rain water sources. A very good example was along the road from Ballinaglera to Ballinamore over Bencroy. 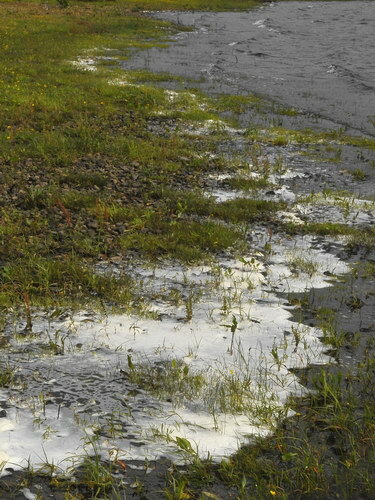 In a drain beside the road we spotted a lot of foam of this nature too high up to be of normal domestic origin. We followed the drain for about a mile wondering could Sphagnum or Sheep urine be providing the surfactants and believing that it could not be a synthetic source that high up? Eventually, we came to a small dump beside the road almost entirely made up of Fabric Conditioner bottles! Obviously this fed our prejudice — is it still possible that all this new foam is coming from altered natural sources? In the drain (shown below) at the back of our house we have often observed foam after heavy rain in recent years. There is no higher ground adjoining this drain and there is no obvious other source of detergent, phosphate, or surfactants. Normally the foam is bright white. Today (12th Sept. 2013) it was pink! Foam associated with rain alone: Sample pipe source (LEFT) and record of phosphate levels determined in pipe and pure rain. All test were done using a Hanna Hi713 Phosphate Low Range ascorbic acid method. This is designed for low level environmental application. Samples 6 - 7 were three separate samples even though they produced the same results. Stated accuracy at 0.04ppm is ±4% of displayed value. Heavy rain does seem to contain low levels of phosphate but this is added to when water comes off roof, as supported by colouration seen! Recently we have been investigating the rain! Could phosphate or surfactant material be coming down in the rain? We pose that question because it seems more and more as if rainfall is associated with fine grade foaming. If this can be established could this be a source of phosphate that might enrich the lake and create the CyanoBloom we saw last year? Certainly in this study period late Summer rains are a well recognised phenomenon throughout NW Europe! Analysis were done of the phosphate levels in the drain (shown), from the downpipe before it entered the drain, tap water, and clean rain water directly from a sterilised stainless steel container in an open site during heavy rain. Water in drain at downpipe from roof of our house. drain and from open rain water. To fine tune this study we then collected water in sterile containers away from any overhanging objects, i.e directly from the sky! This and the above drain sample were all tested for Phosphates and the results are shown in the Table above. Because of the need to maintain cleanliness no collection sytem was used for the rain sample, just relying on a large stainless steel saucepan and heavy rain. Samples were small, enough for phosphate analysis but not enough to try and generate foam. However, no foam was visible in the direct rainfall samples. The implication is that the foaming agents originated from our roof or its biological colonies — bacterial, mosses or fungal? The important question remains — could there be phosphate in rain? In G.R.Fish’s article in the New Zealand Journal of Hydrology he states that in tests run between 1972 and 1974, sampling 341mm of rainfall, there was on average 0.057gm Phosphate/ha.mm (per Hectare per millimetre). This equates to (0.057gm /m3 X 10) or 0.057 ppm Phosphate which is similar to the results we have got. High rainfall areas received higher levels of nutrients. One thing we have noticed during this time is the onset of heavy rains in the late Summer/early Autumn period in Lough Allen. In most years since 2008 the rare orchid, Spiranthes romanzoffiana, has been drowned while still flowering or shortly afterwards. 2013 has been an exception in this regard. Maybe the lower Summer rainfall this year has been a factor in reducing nutrients (phosphates and nitrates), preventing a bloom, and reducing the presence of foam in streams and on the lake shore? Location: North east Lough Allen from Corry to Fahy, including the islands, shoals and bays. In between the Reports from WL18 - WL22, below, there have been many days when observations have been made of, or on, the Lake showing the water to be very clean. For the purpose of the WaterLog it is not possible to record every ‘good’ day. After all, these should be the norm rather than the exception! But it can be seen from the pattern of these Logs that there is a steady and sustained improvement in the water of Lough Allen, particularly as compared to last year. This is a great relief, the cause is not clear, but hopefully the foam will continue to reduce and a blue-green algal bloom may never recur. Certainly, for this year we are confident of that! But it is important that we all seek to reduce any levels of contaminants that may be entering the lake as weather conditions in future years could use this pollution to trigger another disastrous algal bloom. Today, was a good example, overtly a perfect day but with some shadows lurking in the bushes! 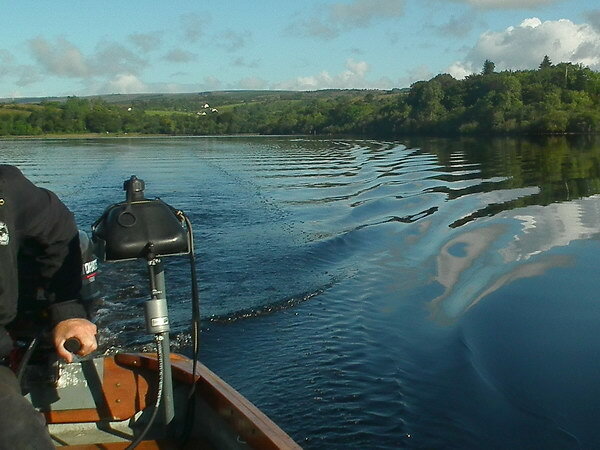 When launching the boat at Corry Strand it bcame clear that Lough Allen was looking at its best. The boat slipway there is beside a small stream that drains the hills behind Corry. Occasionally there is evident foam emanating from this stream. Today the stream onshore and the water off the beach were both perfectly clean. Pollution of this sort is very persistent and it can remain in the lake for a long period, coming and going as the wind blows. It is long-lasting and repeatable. It may not be toxic but it may encourage things that do produce toxins, i.e. 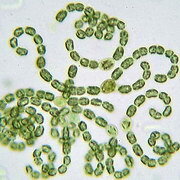 Blue Green algae (Cyanophyceae). And we don’t want them and all their antisocial effects in Lough Allen. 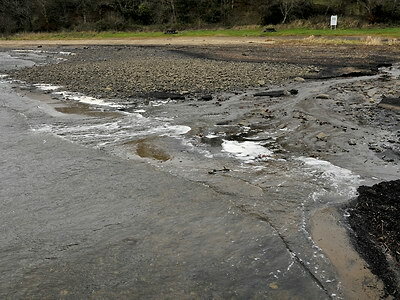 Stream at Corry Strand showing visible contamination! Based on the observation above, it seemed appropriate to implement a Bubble Test as close to the stream as possible. Bubble Tests are a standard test we use to measure levels of surfactant (presumed mostly to be synthetic) in the water. It consists of a standard run of the boat along a fixed course at a steady 5 knots and then any pattern of bubbles left in the wake are defined. Strict parameters are specified for designating any contamination as slight to serious. Photograph on the right shows such a test in progress. This test was taken near to the site of the above photograph and as soon after it as possible. It was a negative test; i.e not enough surfactants to significantly lower surface tension and generate large bubbles. That, of course, is good news and represents the pattern we have been observing thoughout the Summer — overall improving water quality! Short time later: Bubble test off Corry Strand showing up CLEAR! During this morning two other tests were applied. Both were clear. 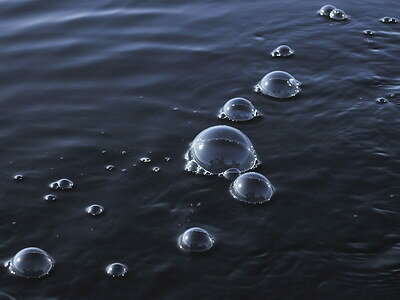 This means that there are no bubble forming agents in the lake, or they are present at such low levels as not to alter the water quality, or they are not present in sufficient amounts to be quantifiable with the existing methodologies. Photograph on the right is included to illustrate these points. 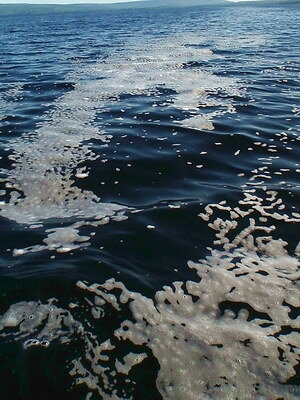 A straight line of bubbles can be clearly seen behind the boat back as far as a sharp turn in the boat’s course. (This is the test start point.) The duration of the test is 1 minute. If at the end of this no bubbles were produced, or bubbles were produced but dissipated before the end of the test, or bubbles were small in size or number — then the test may be scored as ‘0’. We maybe feel there is some change but it is not measurable. 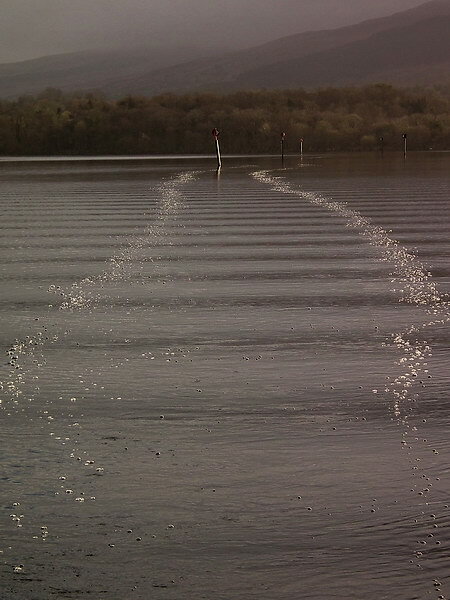 In this way we are able to say that water quality in Lough Allen is much better than last year, or earlier this year, when we had no trouble leaving bubble wakes that endured for up to an hour behind our boat! Terchnical visible bubble trail but passed ‘CLEAR’ as does not match measuring standards. WL22: Small amounts of Foam back! Water: Ruffled, temperature not taken, water level at lock 2.6m. This was a shore based trip aimed at checking out another area for Spiranthes. The environment is suitable for the orchid but none have ever been found here. Unfortunately some noticeable examples of that bright, white foam, that has been largely absent from the lake during the hot Summer, was present again. 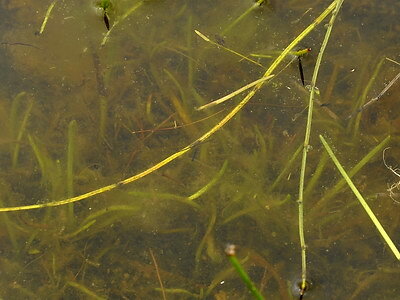 Green algae were present but there was no sign of blue-green algae — which is good news. An overview of part of the bay south of the Yellow River with pockets of very persistent foam clinging to the vegetation. 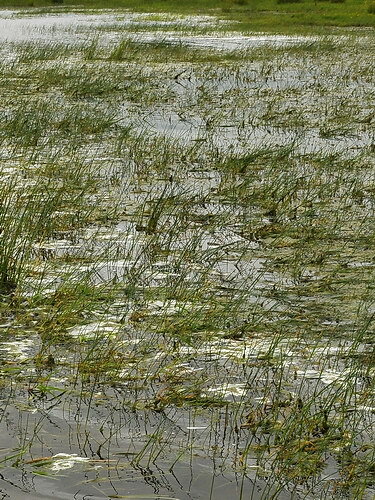 Among the rushes large amounts of Green Algae were actively growing. This is NOT a risk, but is it related to the foam? Foam being backed up and remaining on the shore by slight ripples and gentle SW breeze. This did not qualify on any of the metric standards we use to quantify pollution... but unsightly still! Boat trip to Corry, Drummans and the islands and inlets on the north shore. Water quality continues at a high level this Summer. Small local issues occur but today was a long boat trip basically around the northern half of the lake. No foam was detected on shores and no bubbles were seen in our wake. Work concentrated on Biodiversity and concerned Lapwings, Terns and Spiranthes... the way things should be! Calm clear water in perfect condition! Bay on the east shore with zero foam. The legacy of our cold late Spring still affects Nature and many bird species are absent because of that, even though conditions for breeding are now good. But it is good to record that contamination of the lake was not observed today! WL20: Some signs of water contamination. Boat trip south and east shores! Air Temp. c. 22°C, Water Temp 21.0-22.8°C. Water level 2.46m.. This is Spiranthes country with Spiranthes orchids occurring both on the shore (Right) and the islands on the Left (in former years). Observations: I Presence of Bloom. Today for the first time in 3 weeks we have observed a small Cyanobloom (a blue-green algal/Cyanophyceae bloom). This bloom was found in the still water shown on the left of the photograph above. This is a still channel (sometimes dry) between the two small islands we call Spiranthes Islands, off the Corlough Shore in Drumshanbo Basin. We have seen a short-lived but intense bloom in an isolated pond in this area several years ago. 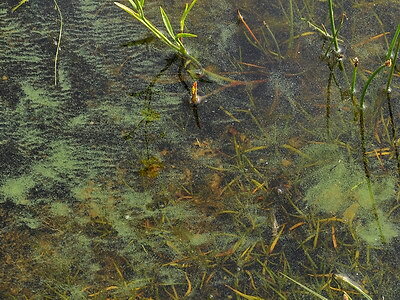 Both the fine specks and the congregating colonies of blue-green algae can be seen in this image. They are starting to form linear streaks and larger rounded colonies. This is the intermediate stage between cells being present in isolated or small clusters and all the small colonies merging together as a major bloom over a lake or part of a lake. Thankfully, the area involved was quite small, c. 20 sq. metres at the concentration shown in the photograph, but present in most of the channel at a lower concentration. Specking was readily visible in the open water to the south of the islands for about 70 m. off shore, but this was too dispersed to sample. Samples were, however, taken in the area shown. and have been examined. Samples were examined microscopically and a few images are shown. 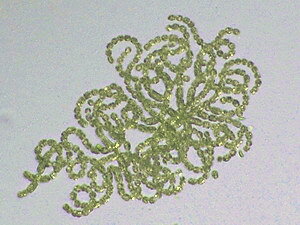 On Left is a small chain of Anabaena sp, one of the main bloom components. Blooms initiate when cells start to join together. They then form chains and spirals. These overlap and intertwine and form dense colonies. In suitable conditions these colonies will rapidly take over a body of water. These suitable conditions require nutrients to be present (specifically Phosphate), the water to be sufficiently warm and, most importantly, the water has to be calm. 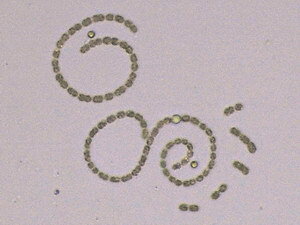 Anabaena is a term we use loosely for members of that Genus. There are many species and LAB would not have the ability to distinguish them. However, they are a major component of Blue-green algal blooms and we monitor their presence in Lough Allen whenever we see them. These photographs were all taken from samples obtained above. Anabaena fix Nitrogen and certain species can also produce toxins. These may be used to control grazing, ie to control the bloom being devoured by planktonic animals! This photo shows a broken part of a chain with a couple of Heterocysts present. Heterocysts (‘other cells’) are specialised cells which develop as a cluster matures. They extract Nitrogen from air and transfer it to other photosynthesising cells (the green ones). 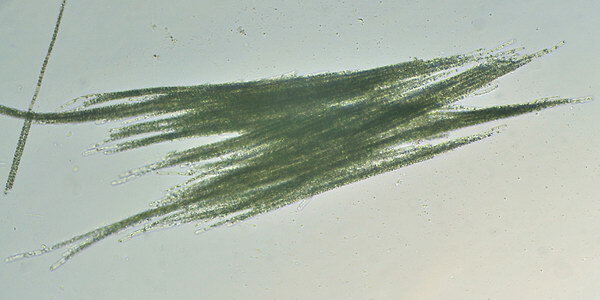 Heterocysts are specialised nitrogen-fixing cells formed during nitrogen starvation by some filamentous cyanobacteria, such as... Anabaena. They fix nitrogen from dinitrogen (N2) in the air using the enzyme nitrogenase, in order to provide the cells in the filament with nitrogen for biosynthesis. This photograph shows the largest grouping of cells we saw in the sample taken from Spiranthes Island today. In terms of Cyanophyceae, it is tiny! This cluster was barely detectable as a small speck in the water on the microscope slide. Imagine the size of the colonies needed to form a continuous pea-soup appearance across a lake or an inlet — as does happen when these blooms run riot. 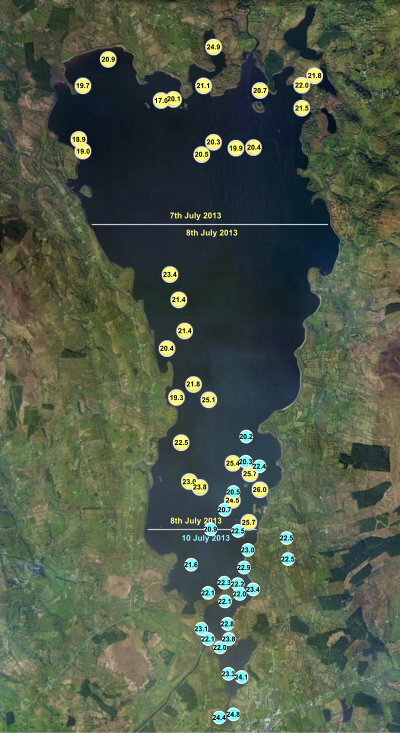 Both the openwater samples and the Rossmore samples reported in WL18 and WL17 (below) show much more advanced colonies, and these led to no significant blooms in Lough Allen this Summer. The EPA suggested to us in January that there would be ‘no algal bloom in Lough Allen this year!’ We wondered how they knew but it looks as if... they were right? We think, and we hope, these isolated occurrences of bloom species are NOT NOW going to lead to a bloom or any problem with bathing or animals. This is based on the experience we have had this Summer. The heatwave leading to the serious algal bloom last year was much earlier in the year and maybe other conditions (Nitrogen and Phosphate levels) were in some way more suitable to trigger a major and sudden burst in growth in Blue-green organisms? Observations II: Foam and Bubbles. A small amount of foam is appearing in patches around the lake (Corry and Cormongan). It is very slight and does seem to burn off during the day. Present warm and breezy conditions do not seem to sustain foam for long and it has to be said that areas of foam and streaks of scum that have concerned us particularly in mid lake off the 3 ‘Cormongan’ islands are largely a thing of the past. However in this general area water surface tension (an indicator of surfactant presence) is lower than it has been in recent weeks — leading to more noticeable sustained bubbles in the wake of the boat. Admittedly we have reproduced this photograph at rather a large size. 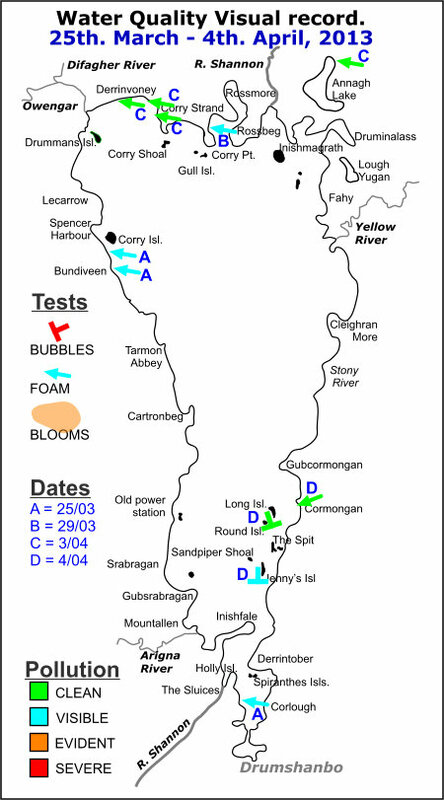 Five Bubble Tests were conducted in in all areas of the lake from Drumshanbo up to Cormongan. Test sites were chosen when persistent bubbles were detected in the boat’s wake. Under parameters defined for quantifying these observations, the record described below was the most significant. Location: 54.08500, -8.05125, Heading North, Depth 6.2m. This yields a Score of 3 which we have defined as Serious! The image on Right attempts to show these criteria with golfball size bubbles behind the boat and those bubbles remaining visible back up to the top of the photograph which approximates to the start of the run. We do appreciate that this image is not as clear as others we have shown — taken in calm water. But the trail was evident enough at the time. We have seen much worse results earlier in the year, and last year, but this one is recorded as it does fit all the parameters laid down to help standardise this class of visual sign for water quality change. 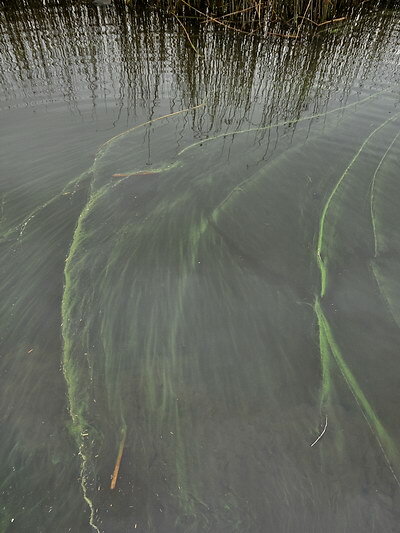 The presence of large persitent trails behind a boat is not a good sign, does suggest the addition of artiificial surfactants and these, if they come from detergents also containing phosphates, may provide the food needed by the Blue-green algae! Kilgariff, Rossmore and Spencer Harbour... by road! Air Temp. 17 - 18.5°C, Water Temp 20.5°C at Spencer Harbour. Water level 2.54m..
Hopefully this may be our last WaterLog for a while. We are confident that the lake is over its risk of a major bloom as it is presently clean and water temperatures are abating somewhat. We chose the areas visited to check for the emergence of any Spiranthes orchids and to look for shore line pockets of Cyano-bloom. Neither were found! Rossmore is a prime site for L. Allen’s rare orchid. This is the perfect time for them to start emerging, though it does vary a bit. Rossmore does not have a significant stream entering into it and is connected to Lough Allen by a wide channel, so there is a ready interchange of water with the main lake. A small bloom was reported here on the 7th July. It is now totally gone! Nor did we see any Blue-green algal bloom at the other two sites visited today or anywhere around the lake since the 7th. This is brilliant considering how warm it has been and, though rarely flat calm (which these organisms love), it has been very close to it for long periods in the past 10 days. We would now consider Lough Allen safe to swim in and safe for dogs. We have not heard any comments of people getting rashes from entering the lake this year? Detergent and bubbles remain a slight probem affecting the appearance and appeal of the lake. But, hopefully, they too can be eliminated. What we did see today was an increasing amount of Green Algae but in perfectly normal amounts and of no concern. The only significance of this material is that its name may easily be confused with the toxic and dangerous Cyanophyceae (“Blue-green algae”). 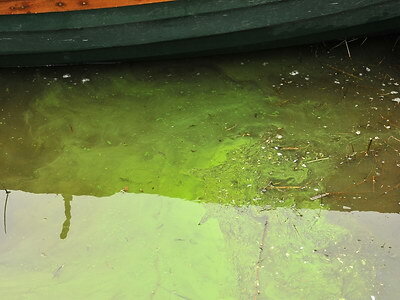 They are very different and the images below are of Green algae — which is harmless and natural in a lake like this. The filamentous green wooly material in the LEFT photo is Green Algae and, Yes, it is a true alga — like seaweed. A handy check is to put a stick into the water and lift it out gently. 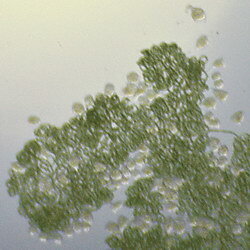 Green algae will emerge as a tangled wet mass like green wool! 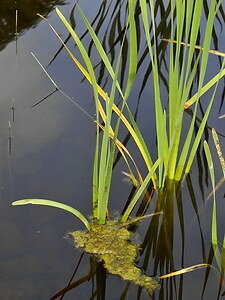 Green algae often develops around other plants and is here anchored around the base of a Bull Rush. It can build up in shallow water and be washed ashore in big masses in windy conditions. This is common, harmless, and of no concern. 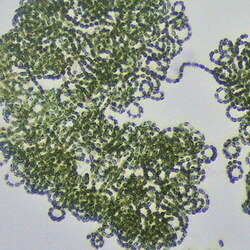 It is a primitive plant (an alga) whereas Blue-green algae is, in fact, a Bacteria. 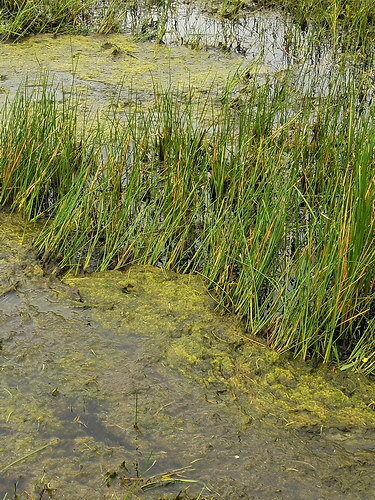 The Green Algae will be found on shores or in nutrient rich ponds where cattle or birds have been. It is always filamentous and apart from clogging up a waterway and making a bit of a mess, is harmless. The Blue-green bacteria is very damaging, can produce toxins, and starts as microscopic specks but leads to lake wide blooms! In fact, as we were editing these pictures it looks like there are some specks in the centre Photo (from Rossmore) which may be Blue-green algae? We did not see these when we were in the field, i.e. there was no bloom! This has been a hectic week, and a worrying one, but it turned out OK! Having weathered the heatwave we have a lot of confidence in Lough Allen for the rest of the Summer. This may be the last frequent WaterLog for a while, unless something unforeseen happens. There are still issues with Lough Allen’s water, and the way we treat it, but certainly the resilience the Lake showed this week to a major change in temperature and a complete reversal of weather patterns, was both reassuring and very puzzling! Weather: Cool and breezy at first then calm, sunny again. Light northerly breeze at start with surprisingly choppy water with a modest swell (30cm) becoming smooth and limpid by afternoon. Air Temp. 14 - 24.5°C, Water Temp 20 - 25°C. Water level 2.58m..
As described in previous Log, the main purpose of this trip was to complete a survey of water temperatures around this lake. Water temperature, calmness and sunshine are important factors in the development of any algal bloom. None was found! Some worrying scum was found in several places, particularly in a region that was badly polluted in 2011. This is a bit worrying and details are provided here. However, it must be emphasised that no sign of a Cyanophyceae bloom was detected and the water, though not as pristine as previous days, seemed fairly clean overall. Both these factors may be due to the choppy or rippled water during most of our trip. While launching our boat we found persistent white foam. This was quite a surprise as we haven’t seen it for a while and it does seem to be decreasing. Could the heat be burning it off? This morning was cool and misty with a slight northerly breeze so this small amount might have built up overnight? In the middle of the Lake, north and west of Long Island this disturbing band of persistent foam was occupying a flow channel running down the Lake. It existed from Coordinates 54.09838, -8.04657 to 54.09381, -8.04821, a distance of 0.51 km. This foam only congregrates in the calm flow lines and it seems to further stabilise them as shown in the third photograph. The third picture is a close up of this scum. Some people talk about natural surfactants, some people say there is no such thing; we believe this is man-made surfactant of recent origin. There is a mantra abroad nowadays, beloved of officials, saying that all strings of foam are natural. We disagree; Lough Allen didn’t have these in the past — as far as we know? The two litre sample collected contained 5 colonies, about the size of the tip of a needle. This is as low as you can go and the water is pure at least in regard to blooms; the detergent problem still remains. One part of a colony is shown here. Interestingly, these colonies of Cyanophyceae were not strikingly green; maybe there is not enough nourishment in the lake to sustain a bloom anymore. Remember, Lough Allen used always be regarded as oligotrophic (with few nutrients) and it is only recent changes that may mean it is heading towards being mesotrophic — with a fair amount of nutrients. If incoming phosphate bearing contaminants can be kept low the problem of blue-green algal blooms could be a thing of the past! RIGHT: Closer view of the cells, chains, and clusters, that go to form a colony. 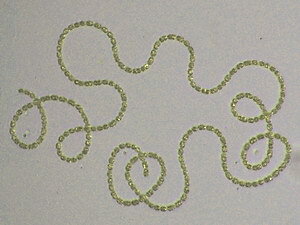 This is Anabaena sp., one of the toxic varieties but absolutely harmless in the numbers presently found in L. Allen. Fortunately, the problem may be restricted to foam and its unsightliness! The sample taken from line of Scum contained next to no Anabaena colonies. Blue-green algae are actually bacteria and like all bacteria they are widely present, only causing a problem when they go out of control. Unlike most bacteria, they photosynthesise in a manner similar to plants using chlorophyll. This gives then the green colour and makes even small numbers of colonies easily detectable in dark water. Weather: Warm, calm, sunny again. No wind at first, light SW breeze later. Air Temp. 21 - 28°C, Water: Only gentle ripples in water everywhere. Water Temp 23.4°C Rossmore, Water level 2.58m.. Even hotter today but the water at the north end of lake is clean and clear. A return vist was made to Rossmore — the only area where we have found Cyanophyceae this week! Travelling by foot the east shore of Rossmore inlet was surveyed and then the east shore of Rossbeg bay was intensively searched for Blue-green algae. A Tale of 2 Cousins! These 2 photos were taken on the 7th July and 9th (today). Both these organisms are Cyanophyceae! 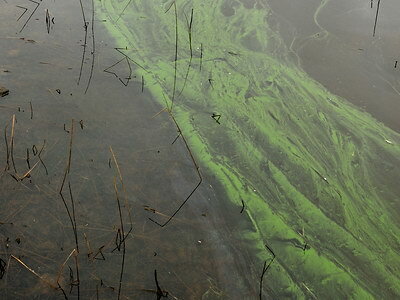 LEFT: ‘Blue-green algae’ including Anabaena (the wicked one) was present at the start of the week (Photo from Sunday). Today the same site was visited and no bloom was present! This larger organism belongs to the same Family as the toxic organisms that create the bloom. Two interesting differences; this species (Nostoc pruniforme) is huge, floats to the surface to photosynthesise using gas bubbles, is non toxic and is a sign of clean water! 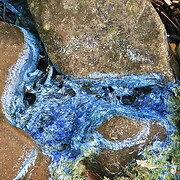 Many examples of this blue-green alga were found today along the shore of the inlet, with isolated other organisms. This is a clear indication that the water is not polluted. Why a small toxic bloom developed here and then largely disappeared regardless of increasing water temperatures is not known, but it’s good news! It looks very much like Lough Allen is weathering its stress test with flying colours. Today and yesterday were two special days when it was a joy to be out on the lake. Blooms may still occur in shltered areas but we are amazed at how the lake is withstanding all this sunshine (vital for the blooms to photsynthesis) and calmness (crucial for colony formation) when two years ago in much colder weather (April 2011) a significant bloom developed right down the centre of the lake — the area we covered yesterday. Weather: Warm, calm, sunny. No wind most of trip but slight southerly wind in evening. Air Temp. 26.5°C, Water: Only gentle ripples and large areas of limpid water bordering on flat calm in mid lake. Water Temp 19.3 - 26.o°C in open water, Water level 2.58m..
A quick upadte for Monday, 8th. Survey areas was mid lake, south of a line from Cleighran More to Tarmon and north of a line from Arign to The Spit and Round Island. Both sides and central lake were checked for water quality. On this day the lake was perfectly clean with clear brown water, no harmful plankton, and no sign whatever of pollution. Water temperatures were incredibly high, mostly from c. 22 - 26°C with a few locations somewhat cooler. This is an amazing rise in temperature over a day or two. We are plotting our data and will update this page soon but we just wanted to say.... we may have got it wrong about the risk of a Blue-Green algal bloom! The conditons now are textbook. But the only small occurence we saw in Rossmore has been checked and is diminishing! We have mapped temperatures, and change of temperatures, during this recent very hot weather. From a low of barely 15°C on the 6th when Leitrim as exposed to cold breezy weather due to a west coast front keeping the Sun away from us, the air temperatures have risen to an unusually high 28.5°. Water has now shown an equally dramatic and sudden change. We had planned to be in a position to provide an early warning of an incipient bloom and not be caught out like last year with the sudden onset of cell multiplication and toxin release. There is now no need for this work, thankfully! What started out as a wise precaution against changing water conditions has now, happily, become a matter of curiosity about how quickly a big lake can heat up given the right conditions and how water temperature may vary from place to place governed seemingly by water depth, flow, and other factors. The map shown on the right will be collected over 3 days. Unfortunately it has not proved possible to do it any quicker. There may, therfore be day to day variation in the readings as well as local variation. For a period the lake will rapidly increase in temperature for every warm day but this will stabilise after a while. The north and middle sections were recorded 24 hrs apart and there seems to be an average 2 - 4°C increase from one day to the next. All these readings are close to the surface, using a thermocouple mounted on a Sounder c. 20cm below the water surface. The measuring method is entirely consistent from sample to sample and, we believe, accurate and reliable. Lake depth was also recorded at each station and shallow water is hotter, deep water is cooler, and very deep water is marginally even colder. It would be interesting to know how much water temperature at deeper levels varies, but we are not equipped to measure this at present. The final stage we hope to complete tomorrow, Wednesday... Those temperatures are now included in Pale Cyan as some data overlaps readings taken in the middle of the lake. The lower sites were sampled between 8am and 12 noon on 10th of July. Weather was initially cool and breezy but quickly warmed up. Samples were taken from the northerly one (20.2°) in an anticlockwise fashion moving south along the middle and the west shore of the lake to Drumshanbo and then returning to Cormongan along the east shore. The last record was the one of 22.4° off Cormongan. Sun, wind, water depth, seem to be the main factors controlling temperature — which may now have peaked? Weather: Warm, calm, mostly thin cloud. SW breeze F1-2. Air Temp. 22°C, Water: Only gentle ripples and large areas of limpid water bordering on flat calm in mid lake. Water Temp 18.9 - 20.4°C in open water, Water level 2.58m.. This evening trip was primarily to study water conditions at a time of rapidly rising temperature. As recently as yesterday the Lake was rough, cool, with a very strong breeze and water temperature was still a lowish, 15.7°C. By this evening temperature had rapidly risen. However, in this brief account, we are happy to report that the lake water appeared largely clean. We have much data to process as we did apply our standard Boat Bubble Test in many areas of the lake north of a line from Yugan Lough to Corry Island. We did encounter occasional areas where our boat was generating large amounts of large bubbles, but these were mainly tranistory and nowhere were we able to record a sustained length of water with significantly reduced surface tension, i.e. pollution. 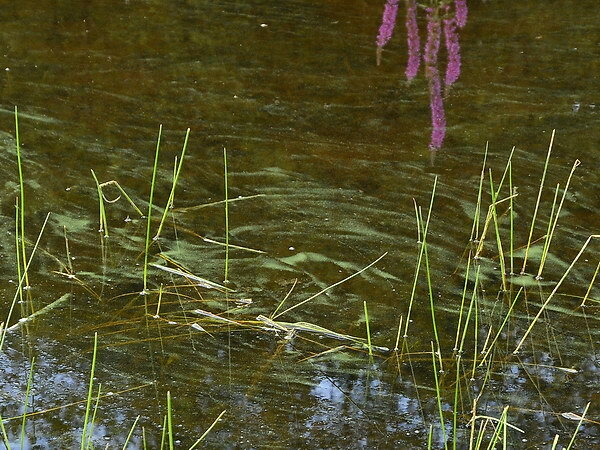 A bloom of Cyanophyceae (Blue-green algae) can be expected in warm calm conditions. Happily no such incident was recorded in a long trip from Corry to Druminlass, Yugan to Corry Island, and Corry island back to Corry Beach. However, we did come across a small but rapidly expanding area of dense Cyano-bloom on the east shore of Rossmore Bay. This was in the area we regularly survey for Blue-eyed Grass and other plants. These colonies were recent in origin but are expected to develop fast. Samples and photos were taken and will be recorded here as soon as we can. This is just a holding Log. We have more to report for this day and during the coming week. Any areas of Bloom (Pea Soup) seen anywhere in the lake should be treated with caution and reported. Apologies for any errors and typos in these logs; they are written in considerable haste. WL14: Not so clean Lough Allen! Weather: Early mist with some cloud later. NW breeze F1-2. Air Temp. c. 7.5 - 15°C, Water: Only gentle ripples and a very small swell with several areas of limpid water in mid lake. Water Temp 14.8 - 15.2°C in open water, Water level 2.5m..
Today we undertook our first Biodiversity survey in a week at the south end of the Lake. It was disappointing; you can see details in LABLog13. We don’t attribute this loss of biodiversity to pollution (yet) but it became clear to us, soon after launching, that Lough Allen was not as clean as reported in the previous WaterLog. Concerns: Algal Bloom: Low Risk: Air and water temperature low, water mostly not calm, but much plankton present (including large colonies of Anabaena, a Cyano Bloom species) which could bloom rapidly if conditions change. 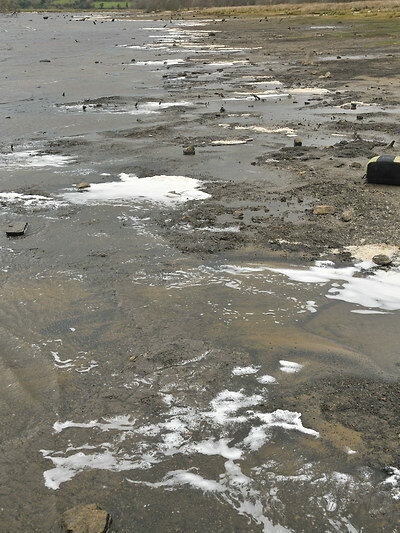 Concerns: Pollution: High Risk: Much surfactant was evident in the water in patches of the southern lake where the water was becoming limpid. There was considerable upwelling in areas like this with much plankton rising to the surface. Presumably surfactants were coming to the surface or being able to affect the surface in these calmer areas (e.g. west of Long Island and towards the centre of the lake). We are not sure whether these areas are made calm by the presence of materials that lower surface tension, or whether the calmness is due to air and water factors and this allows surfactants to accumulate in calm or limpid waters. No flat calm water was seen on this trip! All areas of the lake, east and west, south of Cormongan were covered. Following observations of changing wake behind our boat a series of Bubble Tests (as defined and described in Section F of Table WT 2.1 in our water quality tests) was implemented. Twelve tests in all were undertaken between mid lake and Drumshanbo. Most of these tests showed little or no change in water surface tension and bubble formation, as an indicator of the presence of surfactants. However only 1 site was totally clear and 4 registered severe contamination. All data is recorded in the Table below and 3 images are reproduced on the Right, showing clear water, slight and severe pollution. Apologies for the variable quality of the photographs. This is a complicated process as the geographical position has to be accurately recorded, the speed and direction of the boat monitored, and then photographs taken in often varying light conditions. This was not a perfect day for the Bubble Test as the water was not flat calm at any location. We were pleased with this test. It was not the first and was chosen as an area where all water passes through. This test was run from close to The Sluices heading back out into the lake (eastwards). This result is clear! Having encountered some obvious altered water on our way down, it was decided to do a quick test in the one area where all water entering Lough Allen eventually passes through on its way out of the lake. So water coming from the middle of the lake (where most positives were obtained) and water coming from the town of Drumshanbo, would both pass. The thing about research is you never know what you are going to get! This test run was perfectly clear. Presumably there is a good steady undisturbed flow of water through this natural funnel leading up to The Sluices. It is reassuring and it may indicate that sources of contamination are local and associated with calm water? Test 10 is towards the end of our trip, west of Long Island and in an area of limpid water towards the centre of the Lake. This rated 3 points for presence of bubbles, persistence, and for size of the bubbles. This Score of 3 we consider indicates a severe change in the water. This test was defined as slight, or not very evident, though it can be noticed if carefully studied. The Bubbles did not last the length of the run, nor were they very large, but they did have the appearance of generation from surfactants. This is a strange Summer with persistent light winds, some fine warm weather, and some cool damp weather. Neither the wildlife or the lake seems to know where it is going. We, too, have varied in mood from optimism to realism. However, it is true to say that there is ‘something going on in this Lake’ which was not happening in 2008 or before. It is not the purpose of this WaterLog to discuss this; we are just anxious to monitor and (hopefully) report improvement. The observations recorded here are a bit disquieting. It seems quite likely that given a bit more heat and allowing the water shown in the two mid lake tests (Tests 2 and 10) to become flat and still for a day or two — then the ever present Blue Green organisms would probably rapidly multiply. These sites are in the same area as we reported the presence of a long stream of scum and associated bloom in early 2011. Conditions, at the north end of the lake have remained much better and birds and mammals seem to be enjoying a belated Spring! But the same concerns apply up there if we get any ‘good’ weather. Size: 0 = Grape Size / 1 = Golf Ball size / 2 = Tennis ball size. We are trying to predict pollution — not wait ‘til it happens! We appreciate that some of the pictures, above, do not seem dramatic and the way they are produced may seem nerdy to some? However, they may provide a means of recording the clean up of the lake, hopefully to such an extent that environmental and personal loss will be a thing of the past? The photograph (Right) is a small section of a clump of scum gathered of the tip of Inishfail. The water was limpid here, i.e. almost calm with a smooth surface but still containing some remnants of a swell. These are not the conditions in which natural windrow type foam develops. We were surprised to see this scum (coalesced foam?) occurring here. 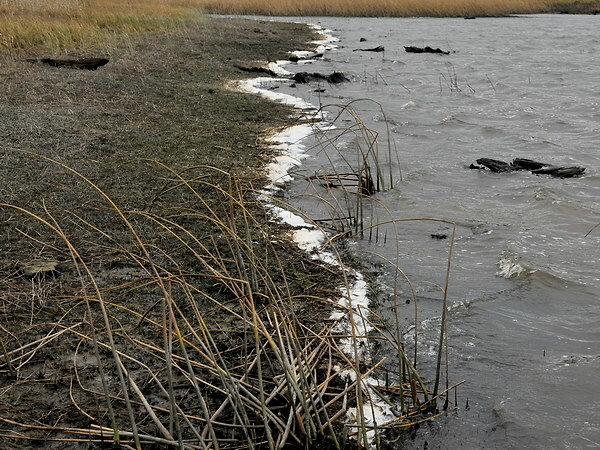 It is the first patch of its kind this year, though larger patches of scum were recorded off Long Island (in particular) last year. If weather conditions were ‘normal’ this situation could have been a major Cyano-Bloom! This scum was associated with areas of upwelling water. With the engine off and the boat drifting at the same speed as the water, significant plankton or plant/animal detritus, could be seen coming up from deeper water — both seeds, dinoflagellates, other assorted rubbish, but also containing sparse but multi-celled colonies of Anabaena spp. This upwelling may also be bringing surfactant material up from the bottom but we, for one, certainly don’t believe this material is of a natural source. This belief is based on the quality of the foam and the condition of water and weather at the time. This surfactant may be producing this foam, as well as the large bubbles diagnosed on our Bubble Tests — hence the reason why we conduct these when the lake may seem at first glance to be clear. Unfortunately, our National experts dismiss this evidence and the concerns of local people as a purely natural occurence. With our regular experience on the water we are reluctant to accept this oft cited opinion — given with no corroborative evidence. In all our time out on the lake we have never met a survey boat from either Fisheries or the EPA! It is not good science to be dogmatic and we do try to back up our opinions with loads of data, observations, news from people around the lake, and some simple tests. The EPA, we know, do infrequent tests, have concerns about some of their own data, do not understand waterflow in the lake, and seem unwilling to accept what local people tell them? This is a shame and an indictment of good water management; it is the start of a slippery slope towards lower water quality — except that they will then simply change parameters and say that the water of Lough Allen meets the new standard — while at the same time warning people against swimming in it? Bureaucracy, eh! Why must we wait for another severe algal bloom with associated social and health damage? Compare this photo with the one below, taken nearby. It is unfortunate to have to frequently report bad news. Adverse weather is, obviously, an important factor in declining wildlife in lower Lough Allen. The water is a concern for recreation and tourism and health. We need to make progress in recognising and correcting this. WL13: Beautiful clean Lough Allen! Weather: Fine, clear and sunny. SW breeze F4. Air Temp. 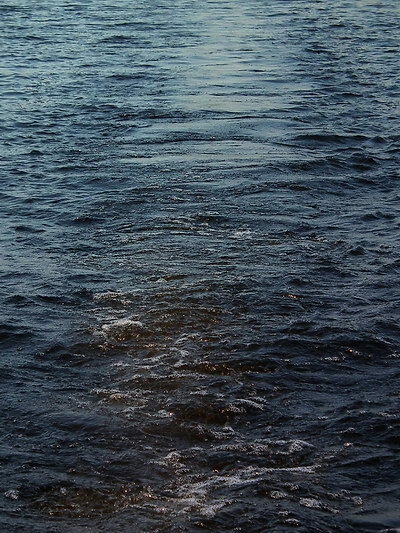 c. 21°C, Water: Quite a swell in open water (45cms. ), clear and fresh. Water Temp 15.2°C in open water , Water level 2.4m..
Thankfully, we have nothing to report here! Just to say it’s over a week since the last WaterLog. The picture below reflects conditions all week in Lough Allen, warm and breezy. This day the wind was from the west so this is a picture of Cormongan. Most pictures are stormier — the wind was quite strong — but this was the prettiest one! Other sites were checked along the east coast all facing into the wind and all equally clean. You will note small breaking waves in this picture but also nearly calm water to the left. With an onshore wind and calm conditions we have come to expect deposits of persistent foam on the downwind shore. We are very reluctant to say that, whatever happened over the past few years, the contamination of Lough Allen seems to be greatly ameliorating. However, the consistent winds are a slight concern, as they have the ability to break up persisting foam. A characteristic feature of this Summer has been a long period of consistent steady breeze or light winds (from differing directions). This is another significant change in weather patterns from previous years, but it is pleasant weather and tends to pass without comment! This picture does show a very pleasant Saturday evening, on Lough Allen. These conditions seem ideal for Person and Dog — if only there were any present? This photo was taken around 6pm. Come and enjoy lovely Leitrim; the water is clean, the landscape is stunning, and the biodiversity is brilliant. Next report wiill be around next weekend. As usual, any news or reports regarding water condition are very welcome HERE... The upcoming week again promises to be warm and, guess what, windy! Water Temp 16.6 -17.6°C in open water, Water level 2.26m..
An early morning tour of the southern end of the lake. For some reason the Biodiversity at this end of the lake is much less obvious than at the northern end. The major breeding colony at The Spit is almost totally abandoned. We believe that this is largely due to poor Spring weather conditions rather than any other factor. However, it gave us time to record a more detailed water quality survey. Today was the hottest day for water temperature in the lake this year. We did see some alarming green streaks and this was the reaon why we took so many samples. Happily, these green spots turned out to be broken up parts from higher plants, a bit like hedge clippings but we were not able to identify them. 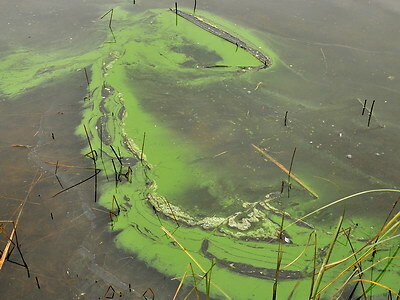 No Blue-green Algae were found, nor any other significant microbial life. The water quality was good but in a few limpid patches, which existed before the morning breeze roughened them up, we did obtain some marginal low water quality results in terms of lower water surface tension. (Tests 01 and 03) A long and continuous band of foam was present along the shore of Holly Island at 8am. but was not wide enough to meet defined serious levels of pollution. By this time a persistent SE Force 3 breeze was rougening the water here where effluent from Drumshanbo treatment plants passes through the lake. The level of foam was lower than in similar conditions last year. Perversely, however, if the weather had been a bit calmer the pollution might have been worse! 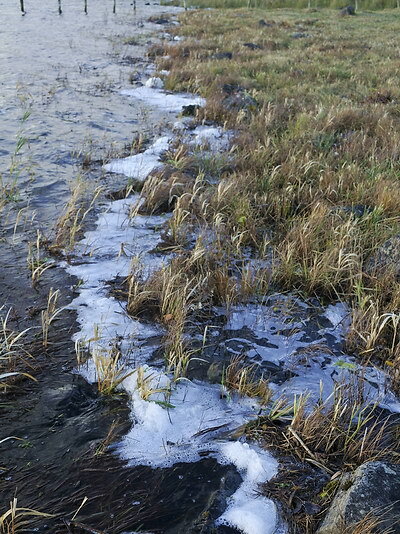 Light persistent foam, such as this, can be removed from shorelines by wave action. All results are presented below. It seems that Lough Allen is OK and probably getting better! Score = 1. Continuous foam but not wide. * For details of Bubble and Shore Foam tests, and rating system, please go HERE. We are heading into a period of cooler and wetter weather and a period free of worry regarding Cyanophyceae bloom, thankfully. WL11: What a difference in a few days! Weather: Fine, clear and sunny. Easterly breeze F1 - 2. Air Temp. c. 14°-16.5°C, Water: Gentle ripples. Temp 14.5 -14.8°C, Water level 2.3m..
What a difference a few days makes? Today we travelled from Cormongan to Yellow River with stops at Yellow River and Stony River — from where this photograph comes. This image sums up this day, beautiful weather though with a stiff easterly breeze (we estimate c. 7 knots). The lake was quite choppy in places though hardly any swell as we were in the shelter of the shore. Trip lasted from 6:30am to 10:30am. Water temperatures in open water ranged from 14.5 - 14.8°C. This was a stunning day for Biodiversity (See LabLog13) but also a good one for the environment. We have been worried for some days that the present warm sunny conditions in Ireland over the past 10 days might trigger an algal bloom in the lake, like we saw last year. All through last Autumn and this Spring there have been worrying signs of foam on and around the lake some, obviously, linked to the presence of surfactants lowering water surface tension. It must be said (warily) that conditions now appear much better! We would say the water had been fully ‘stress tested’ this week if only those persistent breezes had not been present. They kept the water rippled, temperature a bit lower, and prevented Cyano-colonies (Blue-green algal colonies) from forming. Water temperature was lower today and has not reached the peaks endured last year during the Bloom. In fact there was a significant drop in temperatures recorded today from our previous sampling on the 4th June. (See Water Temperature graph.) This probably reflects the situation but there are two factors that could skew this observation. Most temperatures were recorded before 9am. today and the measurements were from the surface of relatively deep water on the east shore, and there was a strong easterly wind! Samples for microbiological examination were taken off Gubcormongan towards the middle of the Lake. A boat wake Bubble Test was carried out here but, while small bubbles were generated, the test was negative — no pollution! Next samples were taken 0.5km. west of Stony River at 7:26am, off Cleigheran Point (7:50am.) and in Yellow River and in Stony River on our return trip at around 9:30. The picture on the right shows the scene at Stony River. Look at the quality of the water, brown, clear, good visibility, no surface foaming either when we arrived or when we agitated the water! Visually this was different to water seen 3 days earlier at the north end of the Lake. The examination of the samples yielded absolutely no microbiological development. None of the species so common in the 3 samples areas reported below (3rd June) were present. On that earlier date a soupy quality existed in the water with small particles suspended in water close to shore. These particles were mostly pollen, water fleas, but did contain small amounts of Blue-green Algae. None of this was present today. The water was pristine! It is amazing to see Lough Allen in such good condition. This is the first trip in two years when we have gone out and seen no contamination at all.The lake is like it used to be from 2001 to 2007 when we used to swim in it. We do hope it will remain so and can withstand further heating and, perhaps, a sustained still water period which we have not really had in the past week. Wind 1-2 Westerly, Water calm or gentle ripples, Water temperature 15.3 - 16.2° C,Water Height 2.32 m.
This long field trip was on Monday the 3rd and was primarily concerned with Biodiversity (See LabLog13). Overall the lake water was clean, clear and natural. i.e it was not producing steely persistent bubbles behind our wake, in any significant amounts. (Three negative tests were run.) In 3 very small and very localised areas water surface tension had been reduced by surfactants. In all these areas (Rossbeg, Yugan Bay and Corry Strand) considerable amounts of pollen was present and this seemed to be reacting and causing microplankton to cluster and develop. Particularly in Corry this was producing worrying levels of foam and large persistent bubbles. This was particularly disturbing because it was generated by children playing in the water — something we have not noticed before! Please take care if the weather gets very hot, if you see green specks in the water, and if unnatural foam is produced by people or animals in the water. Samples taken at those 3 sites have now been examined. Blue-green Algae are present as well as Dinoflagellates and both these organisms can irritate skin. It must be stated that the Blue-green organisms are mainly present as single cells or chains and large colonies are not being found yet! Observations are presented below in the form of environmental photographs and microphotographs of some of the organisms obtained. We hope you find this interesting. There is now (at time of writing) no major reason for concern but the known causes and the known possible outcomes need to be watched vigilantly. June the 3rd was a perfect day. Some stunning places, plants and animals. Everywhere we went the water was clean and limpid, like under the Boat here. Such a pity as otherwise none of our pollution indicators had thus far yielded any quantifiable results. Lough Allem seemed clean! The various elements involved in this dirty water have been identified. 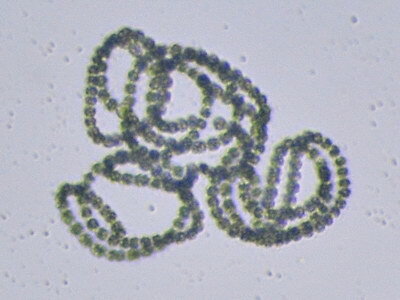 This is Anabaena sp., a Blue-green alga which was present in very small quantities in all 3 locations. 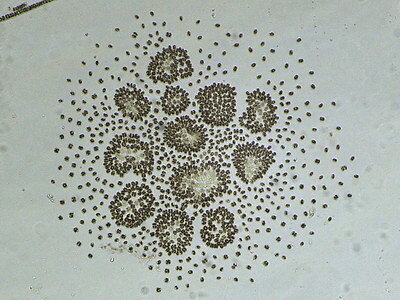 Very few colonies were present and it was only starting to form chains — as shown here. This could have led to an algal bloom but all this week, whilst it has been hot, there has been a consistent light breeze sufficient to ruffle the water and prevent large colonies being produced. These 3 photographs are from the same place, the west shore of Rossbeg inlet at the north end of Lough Allen. This image shows the fine sprinkling of peppery particles and bubbles and scum that ran along 100m. of shore in this south east facing corner. All 3 sites face in different directions and it does not seem that this is wind-blown foam. But why is the pollen collecting? Interestingly, all these sites were at the mouth of small streams! It was present in all samples in considerable numbers numbers. Cloose up of the contamination found at this small spot. Similar yellow or grey coloured contamination was found in two other places. The second site was at the mouth of the channel leading out of Yugan Lake — a west facing shore. The various elements forming the scum have been identified. But where is the foam coming from? Could it be synthetic pollutants providing the surfactant and generating the foam? Pollen is a major component of the material. It was present in all samples and may be from Spruce? The colour in this picture is not accurate; it is actually a bright orange/yellow colour which gives the foam a typically biscuity colour. This is a small section of Corry Strand near the car park. Water offshore was clear. The bubbles and scum seen here was produced by children playing! The straight lines were where they had marched through. The circular patches were from gyrating a small plastic canoe. The pattern of disturbance persisted for a long time afte the kids had left indicating some strong surfactant at play. Broadly speaking Lough Allen water was in good condition today but there were a few localised patches were it was surprisingly poor and people were swimming in one of these areas! Whilst Anabaena was not present in large colonies likely to produce toxins we do have concerns regarding such contamination developing in popular swimming areas. This needs to be watched in warm weather particularly if it becomes falt calm! Wind 3-4 North Westerly, choppy to a swell of 80cm, Water Temp. 14.3 - 15.6°C, Water Height 2.44 m.
This is largely a ‘holding account’. As you can see it is over a month since a Water Log was filed. We have been active during this period and several boat trips were undertaken. On each of these occasions we tried to determine if a quantitative record of water quality could be obtained. 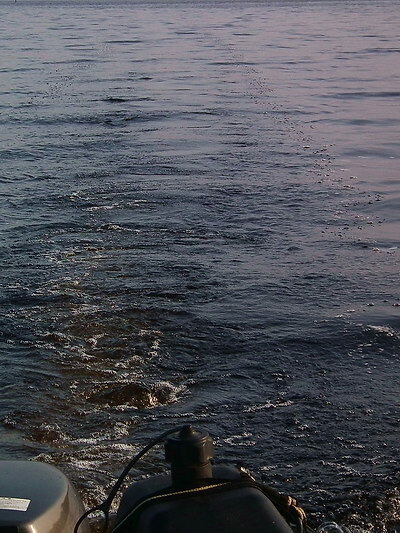 Several Bubble tests were attempted on each trip at both the north and the south end of the lake. All proved negative. It seems that the variety of testing procedures we have set up are heavily dependent on calm weather to be effective! (But this should apply to chemiocal/physical testing procedures also?) Consequently we have had no definitive results to report during this perion. However, this does not mean that Lough Allen water is as clean or as normal as we might wish. On the contrary, there are many impressions of dirty water and watar producing foam that seems unnatutral. We are simply trying to get data and produce maps demonstraing quantifiable amounts of pollution in various parts of the lake. The persistent cold, windy and choppy conditions has made this evidence hard to gather. Main purpose of toays trip was to record water temperatures and see if it was possible to undertake Quantitative Visual Observations on water quality. Trip lasted from 5pm to 8:30pm and area covered was the west coast from Srabraggan south to Holly Island and then across the lake from Jenny’s Island along the east shore all the way down to Corlough Bay. No definable levels of pollution were recorded but, on a purely personal level, the water seemed dirty and increasing clumps of scum developed as the wind increased through the evening. 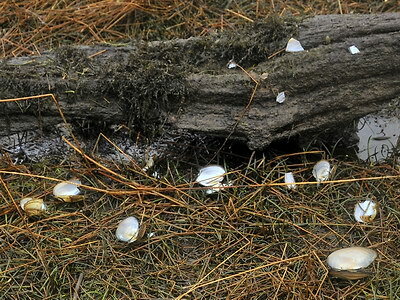 Our water surface tension (Bubble test) was attempted but while medium sized bubbles were present they did not persist in the way we reported on the Last Log item below. However, at time of writing (June 2nd) the forecast is for warm and calm weather later in the week. This should make our tests viable, we should get either positive or negative (hopefully) results and, if conditoins develop as predicted, an algal blool is possible. Obviously, we will update this pollution watch as soon as we have any definitive data. WL8: Serious Indication of Pollution. This was a varied day weather-wise but one in which good numbers of Mergansers and other Summer visitors were seen, for the first time. (See LabLog2013). Survey work was carried out by boat between 7am and 10:30am covering the area from Cormongan, all the islands south of there, and down as far as Holly Island and the large bay just north of Drumshanbo. Weather and water conditions were variable with a considerable amount of bright sunshine and calm waters interspersed with some grey misty weather with increased westerly wind (force 4) and choppy water. Sadly this was another of ‘those days’! It seemed good at first with no signs of foam on the shore at Cormongan or on the westerly side of Long Island or Jenny’s Island, where it couild be expected in these conditions. Instead we found 3 parties of Mergansers excitably exploring and seeking nesting sites! One major example of pollution was, however, encountered during the morning. This rates a 4 point score using the Bubble Test (Test F) described in our Testing Procedures. This indicates a severe change in water quality from the norm. Details of observations and procedures are given below. Apart from this no other quantifiable or severe signs of pollution were recorded today. Perhaps an improvement, but the change in water viscosity is an alarming and striking phenomen indicative of contamination in the water. Table WT F/0423a: Indication of Pollution in bay south of Inishfail. At this stage of the trip no adverse conditions had been encountered. We were busy photographing Mergansers and doing a count of Gulls on The Spit. Heading south towards Inishfail we encountered this tranquil scene, with the lake blue from clear sky over Kilronan Mountain and the windmills on Corry Mountain rotating slowly in a light westerly breeze. This is the first study with defined parameters we have been able to undertake; weather conditions have prevented such work so far in 2013. It was instigated by the changing wake observed behind our boat as we went from the open lake into more restricted water heading towards the outflow from the lake at The Sluices. Over a couple of years we have noticed changing water surface tension leading to the sides of our boat generating these large bubbles in certain parts of the lake. We had wondered was this significant? 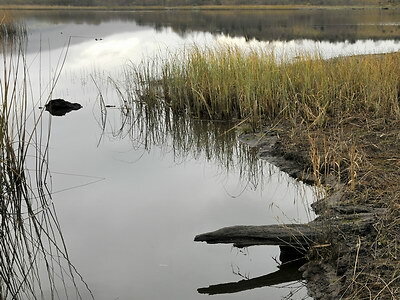 The fact that it used to be very localised in sheltered areas with known sources of contamination, made us suspect that this was further evidence of increasing contamination of Lough Allen. 1. Lake Water entering shallow channels. 3. 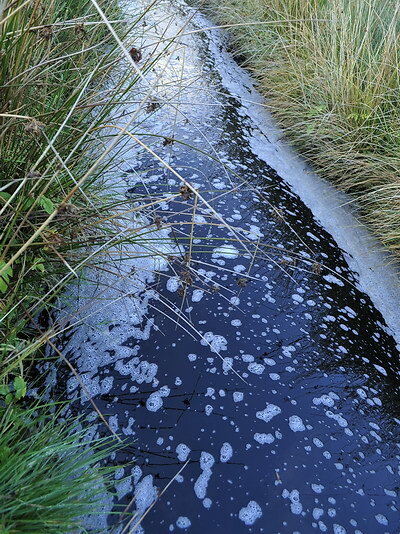 Effluent from Drumshanbo treatment plant. 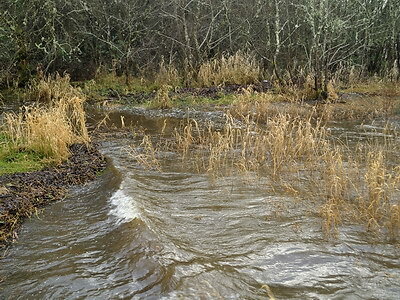 A further test was attempted south of the outflow but was inconclusive due to much more agitated water in a rising wind. It is hard to quantify bubble size and we weren’t aware until recently how big they could become! What you see in the photograph on the left marks a severe change in the nature of the water at this location. Golf Ball sized: Moderate Pollution. Tennis Ball size: Severe pollution — as seen here. We intend doing as many tests like thes as possible and plotting them over the lake in Charts, like the one in WL7 below, to try and identify areas where water quality is being altered — presumably by the inflow of some detergent or surfactant. The size of the bubbles may, of course, reflect increased levels of naturally generated gases in the area. At the time of writing (4th April) the weather has at last got brighter and there is hope for Summer. We are trying out more standardised methods of Visually Assessing changes in the condition of Lough Allen. Today was a lovely day on Lough Allen and it is possible that conditions may be on the mend and the distressing pollution and No Swimming notices that we saw on Lough Allen last year, may be a thing of the past — or else it is just the long cold dry spell is reducing run-off from the surrounding hills and effluents will return with the rain! But vigilance is required and we will continue to monitor water quality in our own inimitable style. Just because the water looks good does not mean it is healthy; that we won’t know until we get a spell of hot weather and the Lake survives that without a blue-green algal bloom. That would be real progress. In this WaterLog we start to implement the Visual Assessment Techniques described in the Water Index Section, HERE. These are..
F. Large Bubbles forming on Lake. Points are allocated for length of shore coated with foam, amount of foam, and foam in calm weather. (See Visual Indicators Table.) Points are assigned for each element and scores of 0 - 3 (or 4) are obtained for each of the Tests A - F. Shoreline deposits are Mapped using Arrows which indicate the direction of the wind and point to the precise point where the test was conducted. Arrows (and other symbols) can be in 4 colours representing the degree of pollution determined. Other Markers are used for other tests. It is hoped that these methods will enable us (and others) to record and report visual signs of pollution in Lough Allen. By quantifying and mapping these occurrences we should be able to notice change and work towards a decline in the severe pollution witnessed in the Lake in 2012. The picture on the left shows one of two continuous bands of foam over 100m. long found south of Corry Island on the 25th. of March. This foam was never very thick nor was the weather particularly calm. This scores this incident 1 point which equates to a Cyan Arrow on the map on the Right. In fact there are two closely placed arrows representing the two stretches of affected shore seen here. The direction of all these arrows, though similar, reflects the wind direction on the dates studies. The wind has been remarkably constant during this period being easterly or a few degrees north or south of due east. Wind force varied a little from light to strong breeze. The tip of each arrow represents the location of the shore deposits as accurately as we can depict them on such a small map. Note the Green (clean) Arrows for the northern shore today — beautifully clean clear brown water! The ‘T symbol’ represents Water Surface Tension observations — persistent bubbles remaining after the Outboard. This is an indicator of increased surfactants. Bubbles in pure water are unstable! 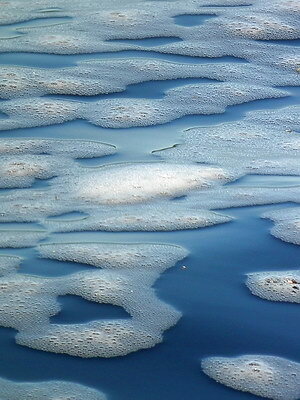 Surfactants actually reduce the surface tension of water allowing a trail of long lasting bubbles to remian on the lake. (See Visual Indicators Table.) Bubble tests can only be carried out from a boat. Two trial tests were conducted on 4th. April but conditions were not suitable; it was hard to find reasonably calm water and the evidence was open to interpretation. By and large the Outboard was not trailing Bubbles but in two calm areas to the west of the larger Cormongan Islands a clear and a slightly positive result were obtained. Algal Blooms: not an issue at this time of year! Pollution in this region is always a concern as it is on the flow path from Drumshanbo Treatment Works to the Shannon where the EPA has recorded significant levels of Total Phosphate. However, the sample witnessed here was only 50m. in length so according to pre-defined parameters this incident qualifies as... clear water! But, to most people such a relatively thick deposit of very white persistent foam would be a matter for concern. Can we say this area is not polluted? The answer seems to be to revise the guidelines and combine the quantity of foam building up in a small area with a shorter length of occurence, and saying that this equates to ‘visible’ or minor pollution? On this basis this location has been given a Cyan Arrow! Photo on Left shows a section of a 100m + band of foam found on the shore on the east side of Rossmore. With the trees and long grass it almost appeared broken but was in effect continuous and persistent over the stipluated 100m. But this was a localised occurrence and was only present in that corner of the bay facing into the strong SE breeze. 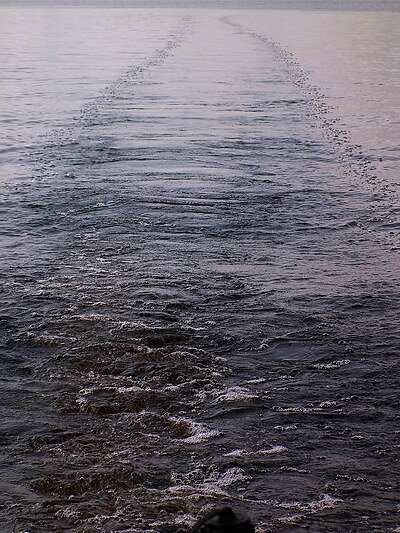 We have been becoming increasingly frustrated with the widespread foam on Lough Allen and it has been suggested that we should try and quantify types and amounts of contamination detected. With this cold Spring L. Allen has not yet started to buzz with breeding birds and emerging plants. So this Patrick’s weekend saw the development of an illustrative card and a scoring system that, we hope, may enable this pesky problem of foam and scum and algal blooms to be more accurately described — and then eliminated! You will find a Draft Chart of this proposal HERE. We would emphasise that this is a highly experimental idea that we have been considering for a while; the ideas are our own but they do seem to have some support in a European research study into ‘Foam in the aquatic environment.’ (More of this anon.) Do have a look at the ‘Chart’ and if you think it can be applied to the situation near you, we would be delighted to hear it. We hope to be able to define water as Pristine, Pollution not Evident, Pollution Evident, and Pollution Severe using a scoring System of 0 - 3(4). All the tests described will enable people to collect information in a much more consistent manner, to share it, and to, perhaps, produce regular meaningful maps of the water quality arouind the lake. 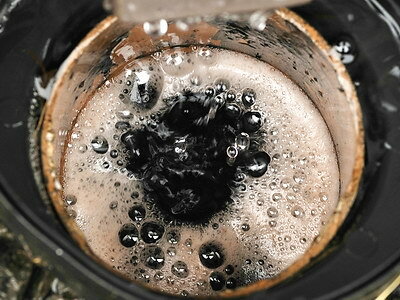 The black bubbles shown in WL5 (below) feature as one of our assessment parameters. Anyway, on the 19th, tired from the computer work LAB staff (all of them) went on a hunt for Mergansers. They are still in the sea around Sligo — though we cannot presume these are Lough Allen birds? Anyway, this hunt was successful and 1 lone male was met on Annagh Lake. See LabLog2013 for details. This dry spell and low water level seems to be suiting the lake. 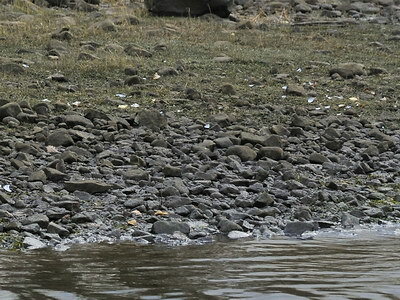 It was good to have a hunch confirmed — L. Allen, at present, seems to have many areas with pure brown water and no foam. Why? Is it the lack of run-off? The survey covered many sites from Cormongan and around the north shore to Srabraggan on the west shore. At Srabraggan a small fringe of foam was present along a shoreline facing into a stiff north easterly breeze. At a glance it was possible to see that under Test A (See Chart) for low level linear foam, this incident of foam was not going to score any points. This would mean that the water was pristine, which it wasn’t! Oh Heck, back to the drawing board. However, the water and the vast majoritiy of shores visited were pristine, with Corry Strand and Druminalass looking particularly beautiful. These two days were the best so far this year. After about 10 days of drought the Lake was at a fairly low level (2.4m) and considerable areas of shoreline were becoming exposed. Biodiversity was on the move but this is reported elsewhere! The first day involved a walking study of Lecarrow to Corry Strand and then a visit to Annagh Lake in the north east. (Locations are shown in map at bottom of this page.) The second day involved a boat trip, the first of the year, across the lake from Cormongan and south as far as Corlough near Drumshanbo. This was intended as a test run to check our equipment after a long winter lay-up. However, everything worked perfectly from the start, so we were able to get in both a good bio-study and a water survey. Shore Summary: This dry calm weather is suiting L. Allen! There has been a marked drop in the level of foam since our last report. A lot of the shore on the north west contained ice along with very occasional pockets of frozen foam. We find the concept of ‘frozen foam’ interesting — there must be a very strong binding agent holding the bubbles together? Some of this foam also contained amounts of small flies. Annagh Lake, the area shown in WL4 below, was clear of all visual signs of contamination today. However, the water conditions were calm, cold, and the water was totally flat. With any bit of agitation one suspects that the foam fringe might reappear? Boat Survey: This lasted from 9:30am to 12 noon. This was a tale of two lakes! From Cormongan latitude south to Inishfail, the lake was flat calm, water temperature was c. 5°C., and it was bright and sunny throughout. In these conditions absolutely no foam was found on the east shore, even in troublesome areas such as the stream entering at Cormongan pier. This stream ‘appeared’ to be carrying no contaminant but was also flowing so gently as to, perhaps, not generate any foam? As we headed south from Inishfail the air temperature dropped from 4.5° to 0°. This was due to an intense fog being generated from the top of Slieve an Iarainn and being carried straight across the lower lake by a stiff easterly breeze. This suddenly, and totally, changed the climate in this area of the lake. We have never seen such a sharp weather divide in Lough Allen. The winter conditions persisted around Drumshanbo well into the afternoon. Weather Impact on Pollution: As we were travelling south from Cormongan we appreciated the clear, calm and clean water. The only visual indication of an altered water quality lay in our wake! Large leaden bubbles were being left behind and remained visible in the distance. This is a phenomenon we often observed last Summer and is due to a decreased surface tension in the water, like what happens when children add detergent to manufacture ‘play bubbles’. As we passed Inishfail and entered the gloom a persistent easterly wind arose. This seemed to have been partially due to the squall effect and also due to coming out of the shelter of Sliabh an Iarainn. For example, the windmills opposite Cormongan were still whereas the smaller ones further south were operating. Foam was being generated here in a short choppy stretch of water. Ice was present in large rafts stretching westwards from Spiranthes Islands (Corlough) and water temperature had dropped to 4°C in the channel. This rapid change in conditions had totally reversed the good water quality observed further north. In this Corlough area the EPA had reported high phosphorus levels and it seems as if the weather conditions was now leading to foam being produced from associated artificial surfactants. Water from Drumshanbo treatment plant would pass through this area on its way to exit the lake via the Shannon River. A thin continuous band of foam was present all along the shore at Holly Island where this water, the small waves, and the easterly wind, combined to generate it and deposit it. As we went north again it was interesting that a similar facing shore, north of the Sluices, was only peppered with occasional patches of foam. i.e. most of the foam producing material had flowed northwards from Drumshanbo and exited the lake via the Sluices? Apologies for the text heavy report; we are working on a system to quickly map and illustrate areas of foam deposition and associated water and wind conditions. To summarise these two days... Lough Allen was looking great apart from a very small area north of Drumshanbo where foam was widely visible. Other areas looked pristine but in all locations visited it was possible to produce persistent bubbles by agitating the water. 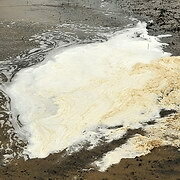 This phenomenon will be discussed futher in the context of aÂ â€˜Foam Reportâ€Â kindly furnished to us by the EPA. Our first Water Log of 2013. Not too much to report but we just wanted to get the ball rolling. The most obvious feature of the end of the old one and the start of the new year has been the persistently ‘miserable’ weather with continuous rain, some cold, and some strong winds. We took the opportunity of a break in the rain combined with persistent strong SSW winds to visit areas of Lough Allen where significant large deposits of synthetically based foam were left after southerly storms in April 2011. Results of today’s brief survey were good and bad! There were no large deposits of foam. The foam seems to have a tendency to be resorbed into the water in stormy weather. This is a phenomenon we have seen in mid April 2011 in between times of more visible pollution, and which we demonstrated HERE! The absence of large visible deposits does not mean the pollutant has gone away and we fear it will be back as long as the cause is not determined and controlled. Close view of beach near Cormongan Pier with natural looking breaking waves carrying no artificial foam hitting the upper beach. Note the flow of water in the background which does, however, contain the foam we are concerned about, streaming into Lough Allen. 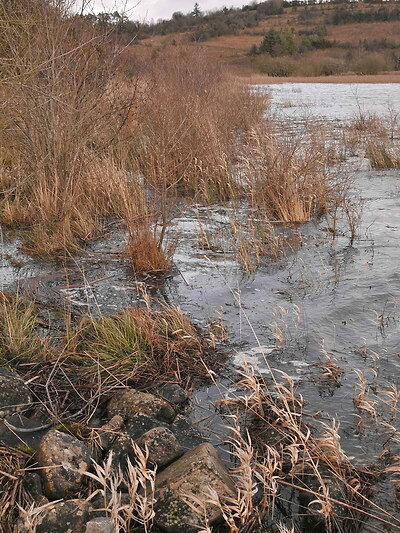 In calm weather foam often accumulates in this area if blocked from entering the lake by a westerly breeze. Today there was a strong flow of water from this stream. Apart from this slight concern, the shoreline at Cormongan was clean. We would be keen to celebrate this but past experience teaches us never to jump the gun. We, regretfully, anticipate that, in changed conditions, the band of foam will reappear along this shore. But we do have to report clean normal conditions when we see them! These two photographs were taken at the north east corner of the lake. By and large this area was clear of unsightly deposits. The open water was streaked with windrows carrying, presumably, whatever the water contained. These ran up into the Shannon itself but, as far as we could go, no major depositions of persistent foam occurred. However, in small quiet pockets away from the breaking waves such foam did develop and persist. In the middle distance, below the main breaking wave, a smaller wave can be seen breaking up and withdrawing leaving behind only natural fast dispersing bubbles! This is natural, unlike the mess in the foreground? Here we can see a larger area of foam building up in a more sheltered, though still quite windy location, on the north shore of Annagh Lake, a largely landlocked inlet. The foam comes from a stream entering close by. This is our first report of this year. 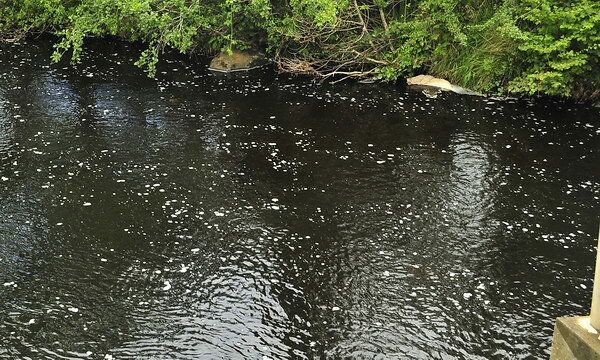 We can not read much significance into a few photographs and comments but it is the pattern and continuation of such occurrences that will tell us that Lough Allen has a serious pollution problem. Hopefully, with the Spring coming in (and better weather) we will soon be able to get back to our Biodiversity studies. That work is enjoyable; this work is disturbing but is essential if we are to preserve our wildlife richness. FOAM: Specifically refers to persistent bright white dense small-bubbled foam. It may float down in patches or lodge as clumps behind obstructions. It can be re-generated by waves. SCUM: Refers to larger areas of flat contaminant often with a brownish tinge covering significant patches of water. Not moving and seems to have been in place for quite a while. Probably of the same origin as above. CLOUDY & CLEAR: Two words we use to describe quality of water under the foam. Cloudiness can come from floods, mud, etc, or from pollution. 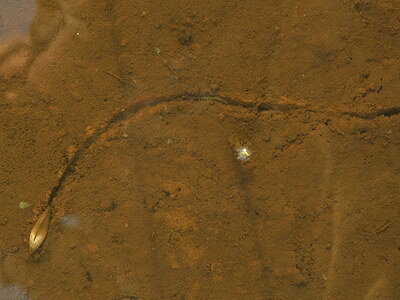 Clear means bottom of waterway is clearly visible and normally of the typical brown hue common to waterways in the area. Results and observations for 21 sites are reported below. We apply equal weight to Phosphate results and visual results. They both indicate contamination, maybe in different ways. A dry morning after a dry spell, Air -1° to 1.5°C. Lake level still high but streams moderately low. Clear, small spots of foam, scum at blocks. Clear, few large persistent bubbles, small amounts of scum. Clean and brown, negligible foam or scum. Clean flowing at sample, large patch of foam where enters Lake. Clean, clear, brown with medium flow. Clear medium flowing water, few patches of foam. Clear, medium flow, few patches of foam. The colouring of Data shown in the righthand column has the following significance. Orange records can be regarded as Nil values. 0.04ppm is within the level of sensitivity of the apparatus used. Red data are records where a surprisingly high Phosphate reading was obtained. In wl302 this was a very small drain and maybe any phosphate present had been concentrated in some way. Also, there were cattle drinknig from the drain — if this can have any impact? The four sites from wl316 - wl319 all were remarkably clean, by far the cleanest streams we have seen around Lough Allen in a long while. It was surprising that wl317 gave a significantly strong reading. (Please note that all the visual observations were recorded before the analytical tests were done!). Blue records are ones where, from the visual inspection, we had grounds for expecting a detectable level of Phosphate — and got none! This survey was conducted in a clockwise manner over 2½ hours. Samples 01 and 21 were taken from the south of the lake. Samples 02 to 09 came from the western shore. Samples 10 to 14 from the north shore, and the rest from the eastern shore. We have reverted to using Latitude and Longitude readings on both our GPS and in Maps. It seems to be much more accurate. The values given in the Table above can be copied and pasted into http://www.bing.com/maps/ and they will (should) bring you to a Map of the area in question. We apologise if this is less convenient than using the National Grid. One thing we don’t advise is using convertors to change the Latitude & Longitude readings back to Irish Grid. Lough Allen is polluted. Phosphate is a significant part of that. We know this from the presence of significant Blooms of Cyanophyceae (known as ‘blue-green algae’). These produce toxins fatal to dogs and harmful to humans. 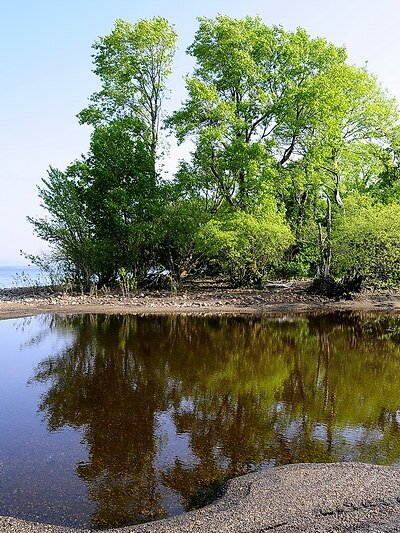 If Phosphates reach a sufficient level, and remain at that level, algal blooms will continue to exist and destroy the recreational and tourism value of Lough Allen. Phosphates occur in Detergents, and many other products. Household detergents were traditionally discharged into a Septic Tank or a Soak Pit located away from waterways. Now they are mixed with sewage and discharged into a mechanised Septic Tank located close to waterways. Unfortunately these Septic Tanks do nothing to reduce the Phosphate levels coming out of them. The imposition of these waste handling criteria on home owners in the past 10 years, or so, may directly have contributed to the foaming problem in Lough Allen? In our experience of the Lake from 2001, it has been a clean Lake with no conspicuous signs of eutrophication. 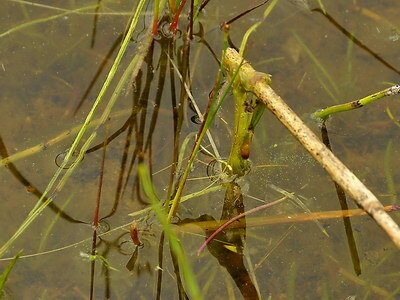 From 2006 we have been studying the Diversity of Life around Lough Allen. Only in the past four years have we seen any visual signs of eutrophication (adding nutrients to the water that help new forms of life to flourish). Even then it was the merest hint of a line of foam on a suitable shore in gentle wind. But now... it is everywhere! 1. To check, at one point in time, if the source of the contamination is widespread and all around the Lake, or just from one major source. 2. To seek to find a way of monitoring contamination that will enable us to say if it is on the increase or is decreasing. This way we can restore Lough Allen! Our conclusion, sadly, is that this pollution is coming from many disparate sources. i.e. quite likely from many small homes and enterprises. We fully accept that this may be unknown to the persons involved and may also be as the result of Planning Conditions. The coincidence of timing between the onset of this contamination, the Celtic Tiger, and changing Planning Conditions is too clear not to suggest a causal relationship between development and the pollution of Lough Allen. However, simple steps can rectify this situation! The relationship between contamination and Phosphate levels is not so clear. Phosphate is soluble in water and may rush through a sample site in a very short while following a small discharge of a detergtent type product upstream. Foam and Scum, which can be derived from various factors but especially detergents, are not readily soluble in water. 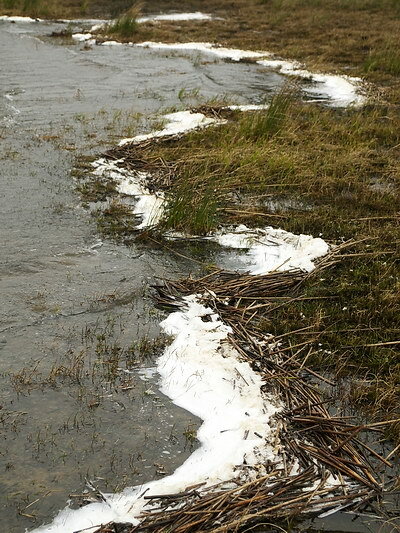 Well, actually, what we call ‘natural foam’ will break down in water within a matter of a few seconds; the persistent thick white foam that we are seeing around Lough Allen in recent years, does not dissolve so rapidly. This is the reason, we think, why some streams may one day have high Phosphate levels and another day have no detectable levels. Also it may be the reason why some highly visually contaminated Sites have recorded zero levels of Phosphate. However, the bigger the river the higher the chances of getting a null reading will be; it’s simply due to the level of dilution in the river. It is very hard to record positive levels of Phosphate in large rivers such as the Owenmore and the Shannon! The Hypothesis — Phosphate/Detergent contamination can effectively be monitored visually and biologically. We have been testing this hypothesis, and a monitoring instrument, over the past month. This Log brings this work up to date. There does seem to be a close correlation between visual signs of pollution and the levels of phosphate present in the water but there are several complicating factors. DILUTION: In any area with a high volume of water it seems to be impossible to measure Phosphate levels. They are simply below the level the technology can detect. WEATHER: To obtain meaningful phosphate levels samples need to be taken appropriately. You can’t schedule a vist for the 29th February 2012 and hope to get true results. If it was raining heavily, or if it rained steadily the night before, the sky may be blue but the waterways will be full of water and ‘zero’ readings will be obtained. This does not mean that there is no waste material or products containing phosphate (like detergent) being carried down the river — it is simply unreadable due to the high level of dilution. SMALL STREAMS and DITCHES: Very much the reverse of the above. Because of the low flow of water it is easy to get a false high reading. Local factors such as somebody washing a car, or a football team having a shower, or some fertiliser accidentally getting into a ditch, or concentrated release of high levels of natural Phosphate, may temporarily give an unusual high. So the ditch or stream will need to be monitored on an on-going basis to see whether it is an unfortunate accident or on-going eutrophication. PHOSPHATE SOURCES: Fertiliser and rock phospahte are not foaming agents. 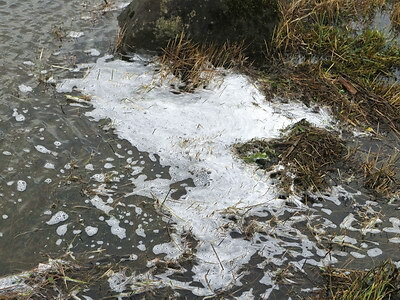 Detergent and all materials we use in washing our bodies contain varying amounts of Phosphate but are all foaming agents — many of them producing persistent white recyclable foam such as we have been finding around Lough Allen in ever increasing amounts over the past few years. We are trying to establish, here, a link between the various signs of pollution, summarised by the photographs above, with a measurable quantity of Phosphate in the water. Locations are not being specifically identified as our goal is to try and improve our environment in a very constructive manner. If this project is successful it may be possible to set up a system whereby people can readily and regularly check for Phospahte levels in small waterways near where they live. The north end of this bay had large deposits of what we define as unnatural foam on the day of our visit. This was also present on the east shore due to the wind direction. 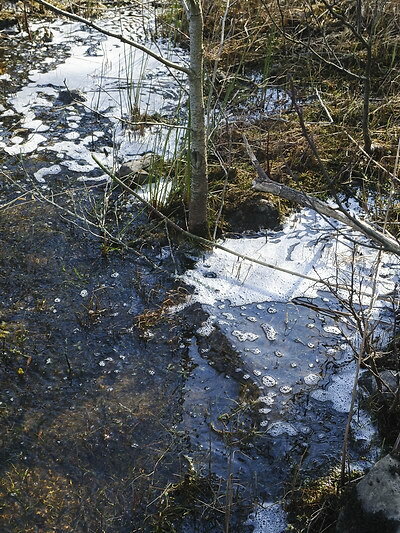 The source of the foam is a small stream entering the inlet at the fence in the background. Same day, c. 100m. upstream from the lake. The water shown here was still flowing into the lake so the material was coming downstream rather than entering from the lake. It was, however, slowing down and backing up. All of this stream was not nearly as visually contaminated as this and we took our Phosphate sample about another 100m. further up where it was a babbling brook with only pockets of foam behind rocks. These photographs display quite a considerable level of contamination. 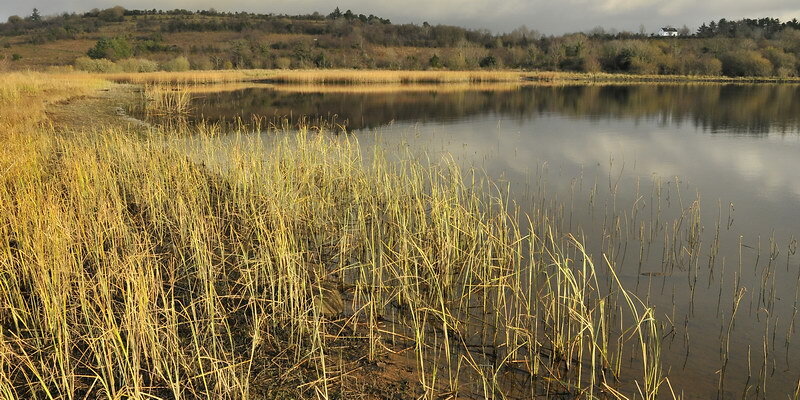 This is a popular fishing and recreational area, important also for Mergansers, Irish Lady’s Tresses (orchid) and, we think, Lough Allen’s rare fish — the Pollan. We have not seen an algal bloom in this inlet but it’s not an area we have access to by boat. However, it has been becoming more visually polluted at a rapid rate in the past two years. We decided to deploy our testing procedure. We are using a Hanna low-level phosphate analyser. This reads Phospahte levels from 0.00 to 2.50 ppm (parts per million) with an accuracy of 0.04 ppm. Use of this is very much on a testing and investigative basis as of now, but this handy bit of kit may be accurate and practical enough to provide early warning of water conditions likely to provoke the onset of future Blooms in Lough Allen. The device is a photometer and it can be used in the field but we tend to prefer to bring samples home as it is quite time consuming. Firstly, the Photometer is calibrated. Then a sample is inserted and the Photometer is zeroed to make allowance for the colour of the water. (Photometers analyse specific compounds by measuring the colour and saturation of the sample.) The Phosphate testing reagent is then added and the amount present is measured by passing a fixed colour light beam through the sample. The Photometer then delivers a reading of Phosphate concentration in terms of parts per million of Phosphate. Other tests (below) have returned null, or undetectable, levels of Phosphate in areas where riveres were visually polluted. As we gain more experience with our local conditions we can predict likely results more accurately. There is a clear correlation between visible contamination, water body size and flow, and the concentration of Phosphate present. We sampled further upstream where the water was flowing rapidly between stones. The water level was moderate, definitely not low but not as high as a few days later after heavy rain. Sampling and recording was done on the 17th November.. We were pleased, from a technical point of view, but saddened that we were indeed able to get a measurement of this pollution! We obtained a reading of... 0.1 ppm Phosphate... This is Pollution! It is 3x higher than what the EPA considers as a Phosphate level in rivers that leads to eutrophication. As usual, in science, nothing is immediately clear. The same stream, further up, on a different day, and after much rainfall, gave a result of 0.02 ppm on the 21st November. This was within the margin of error of our equipment and we think the greatly increased water flow may also have had an effect — but there are other factors that we cannot discuss here. However, we believe the above figure stands as we have got similar results from other small streams that we know are polluted. By contrast to the above Study we have also looked at the Owenmore River, a large river collecting a lot of water from streams in Leitrim, Cavan and Fermanagh. While initially investigating the upsurge in pollution in 2011 we, assisted by our work experience student, investigated many of the tributaries of that river and prepared our site location map of the upper reaches of the Owenmore. We did basic foaming tests on water from these sites but were unable to prove presence of significant quantities of detergent at that time. The photograph below shows the heavy detergent load being carried by this river in 2011. Of all the significant rivers entering Lough Allen this often appears to be the most foamy. We have often wondered why. There is a lot of clear felling going on in the area with consequent fast run offs and the availability of increased organic Phosphate — but this is slow to be released. There would not be a large population or large towns in the area to provide the household effluent in large quantities. 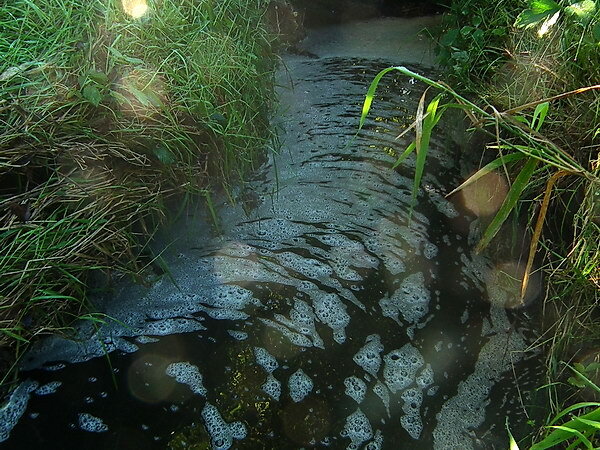 We do not know the answer to this question yet but, one thing we have learnt, is that a small amount of detergent from domestic use can have a significant impact on a nearby stream or lake. Recently, we have revisited this site and we have gone to the upper reaches in search of Phosphate content. This was a dry day but after some rain so the two little streams and the one major river section we sampled, west of Glangelvin, all had a moderate flow of water. Foaming was present in small amounts in the two upland samples and more obvious at Glangelvin. We obtained a reading of... 0.00 ppm Phosphate at all Sites! 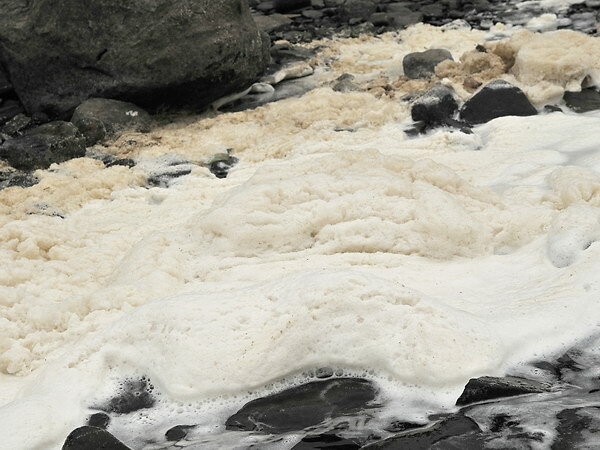 Judging by the foaming and the permanent nature of it, it would seem likely that there is some source of foam producing material entering the water. 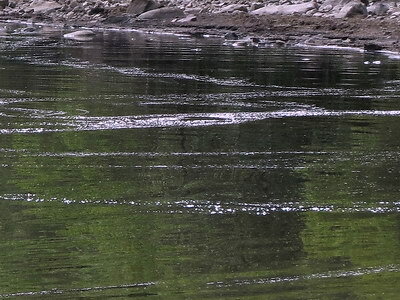 The zero or ‘undetectable’ reading would reflect high level of dilution afforded by the Owenmore system and even the small mountain streams after rainy weather. We report this research just as an example of how difficult it is to measure Phosphate at low levels and yet how persistent some detergent, or whatever product is lining our river banks and lake shores with foam, can be. Even the 0.02 ppm level specified as the risk threshold for Phosphate in lakes is going to be very difficult to detect by physical means. The true solution to pollution in Lough Allen is for us all to avoid letting Phosphate containing material into the environment — from treatment plants, household detergents, fertiliser, rock phosphate, shampoo and bath products, car washing and other industrial activity. We will continue seeking sources of such contamination in small waterways entering Lough Allen, hopefully leading to a clean up of the environment over the next few years. The presence of Pollution is detected by measuring change in a Habitat either through Technical or Visual methods. Technical methods would be Chemical or Physical — seeking to quantify defined pollutants. They cannot measure very low levels of concentrations, they reflect a situation at 1 point in time, and are difficult and time consuming to implement. Visual techniques may actually report a problem before they become technically measurable. Identifying the agent or cause of contamination in an open water body is almost impossible either way. It is a question of following possible sources and hoping to try and identify one or more culprits. It would be rare to find a pollutant in open water so characteristic that its likely source can be guessed! At present we suspect synthetic detergents from several unknown sources as the cause of changes in Lough Allen over the past five years. 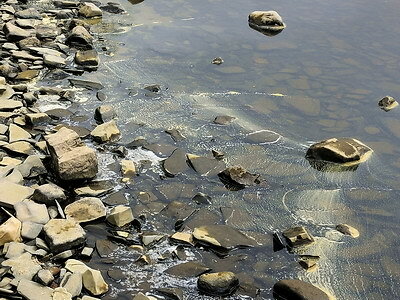 Technical monitoring techniques would include Atomic Absorption Spectrophotometry (useful for heavy metals) and Photometry for more specific synthetic agents.The main impact of detergents would probably be through their Phosphate (water softener) content which acts as a nutrient (fertiliser) for the algal blooms. This cannot be measured in very small quantities by either of these techniques — though interesting new tests are becoming available. Regular trained visual observation of changing water quality can be very valuable. Interpreting or quantifying such data is less easy. Technical surveys may only be undertaken every 3 years; direct skilled observation can be done every week! Consequently visual techniques may actually report a problem before it can be measured technically. By observing foam where it usen’t to be, or by observing the growth of Green or Blue-green ‘algae’, or changes in the distribution of larger plants in the water or along the shoreline — we can help to prevent greater loss. Survey techniques we rely on are synthetic foam observations, persistent large bubbling, scum on lake surface, and the numerous possible biological indicators — Green Algae, Blue-green Cyanohyceae, new species of plants taking over shorelines or open water, Daubenton Bat numbers declining, Invertebrate river surveying, etc.. The observations for this map come from trips across the Lake within a short period of time during dry weather. There is little point in doing surveys in times of flood. We have ‘defined characteristics’ we use to classify water status as either clean or contaminated. Areas of white on the map are parts of the lake not covered or inconclusive. As we publish more maps a pattern may become clearer? First Map is in WL1 below. Calm weather: Water is clear, clean, and golden brown. No unnatural foam on water surface or the shorelines. No algal or bacterial blooms visible. Large bubbles seen on the lake (from propeller, other agitation, or natural sources) not persistent. Rough weather: Only natural spume, white horses, and wind generated lines of ‘’natural foam’ seen. No persistent and very white lines, or bedded deposits, on shore. Calm weather: Large patches of scum or persistent blobs of foam on surface. 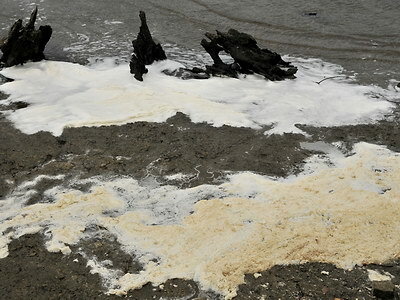 White bands of fine detergent type foam may persist on the shore long after wind has died down. Isolated clusters of Blue-green Cyanophyceae, or full blooms can be seen in warm weather. Bubbles generated by Outboard very large, leaden in colour, persist leaving a trail of parallel bubbles behind. Rough weather: Large rafts/lines of dense floating foam found in open and sheltered water. Dense banks deposited on shores facing the wind. Persistent and may leave deposits behind them that subsequently turn blue. 6th. October. 1:30 - 4:30pm from Corry Strand. Water 13.8°C, Air 12°C, Wind largely calm. Water level 2.7m. Covered the northern end of the lake sticking close to shore and visiting all the inlets. Stream at Corry, which sometimes contains detergent, was clear. 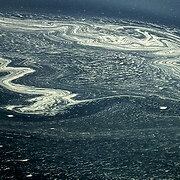 Quite a bit of pollution was observed using our by now standard techniques, particularly in a large area between Church Island and Gull Island where the Shannon was flowing through the lake. This large stretch of water was covered with large blobs of scum which with the relatively calm weather should not have been there. 9th. October. Corry Strand, 10am - 1pm, Water 12.7°C, Air 10.5°C, steady breeze from the north west with occasional slight squalls. Water level 2.56m. We headed directly SE to Cleighran More marina. The whole transect was contaminated with large rounded blobs and this is represented by the southerly edge of the Red Area in the map. Only when we went closer to shore and headed along the shore to Druminalass, did we find a continuous zone of clear fresh water. The stony estuary at the Yellow River, in particular, was perfect. There seemed to be no pollution coming down the Yellow River at this time. The ‘black bubbles’ were again encountered in the channel between Deadman’s Point and Church Island (Inishmagrath). We make little comment on this Map. This is just a start. The methodology needs to be tested and corrected. Also, one set of data is pretty meaningless; if a series of maps reflect similar patterns of contamination then, maybe, we will be able to identify sources. The Map on the left was produced following 3 long trips traipsing across the lake. This period was one of the longest consistently dry and largely calm periods we have had this Summer/Autumn. Water levels were dropping and new water flowing into the lake was at a low level. The large rivers (Shannon, Owenmore) were still full but smaller streams such as the Yellow River were at a very low level. I know this page is linked from the Home Page saying ‘Water Quality Maps’. That is with an eye to the future. We do not anticipate many further periods with the necessary calm and dry weather to allow us to repeat this experiment before next year. If we can just make a few comments. The blue areas inshore at the north end of the lake were strikingly clean but lay very close to bodies of water that seemed heavily contaminated. Perhaps there is a vortex here that protects these areas from contamination in these particular weather conditions. Also, Yellow River itself seemed absolutely pristine in terms of visible contamination.